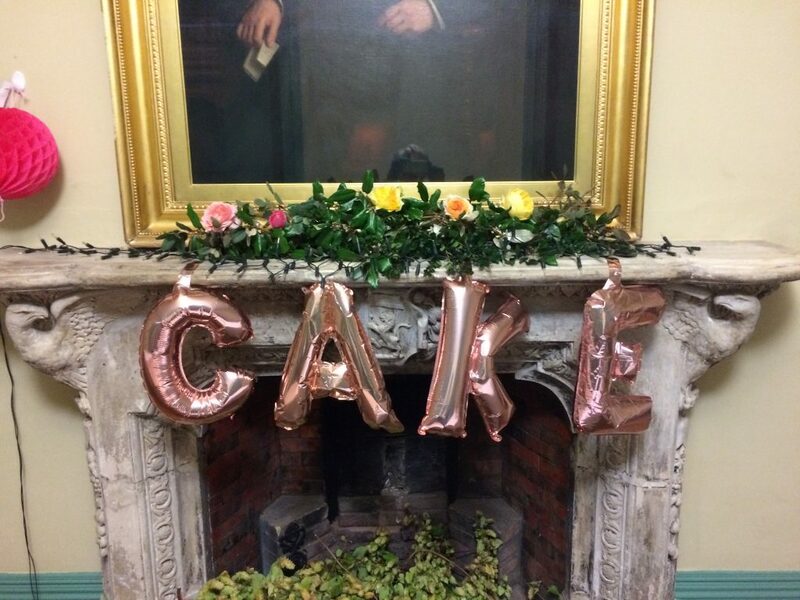 September began with parties and ended with a wedding! After a summer of growing, my cut flowers were OK (nothing special) but thankfully, I had a squad of growers watching my back. Step forward my Mum and Cousin Sue, who between them grew an entire FARM of blooms for our wedding displays. 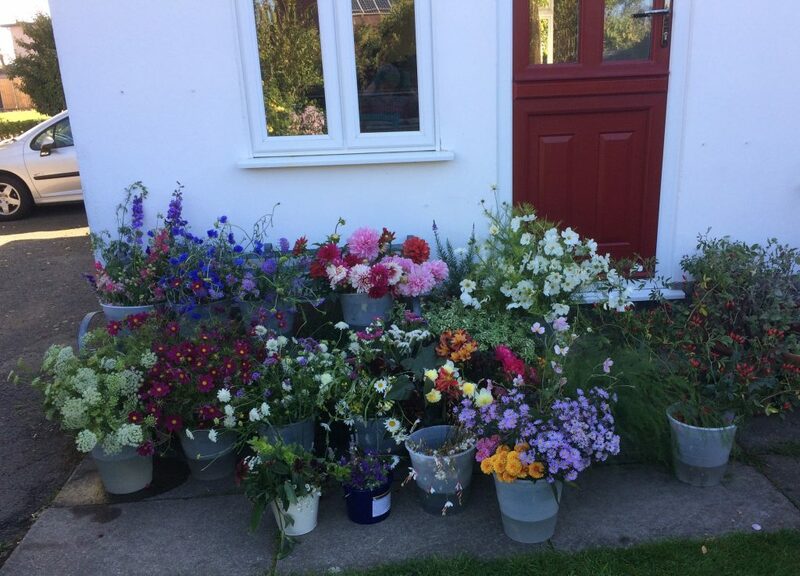 When I asked Sue to help out, back in April, I thought we’d have some pretty flowers that would be just fine, but what we ended up with was better than some professional florestry I’ve seen. 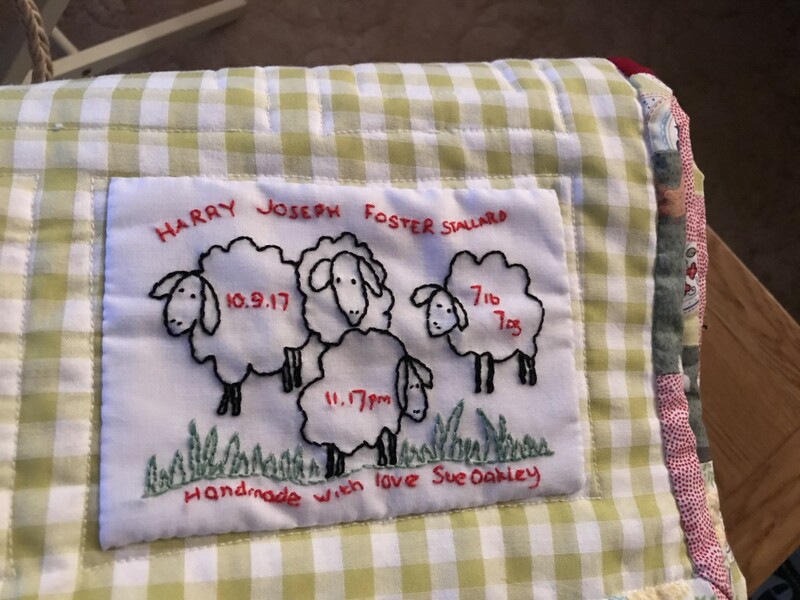 I love that our wedding gave an opportunity for creative friends and family to shine. 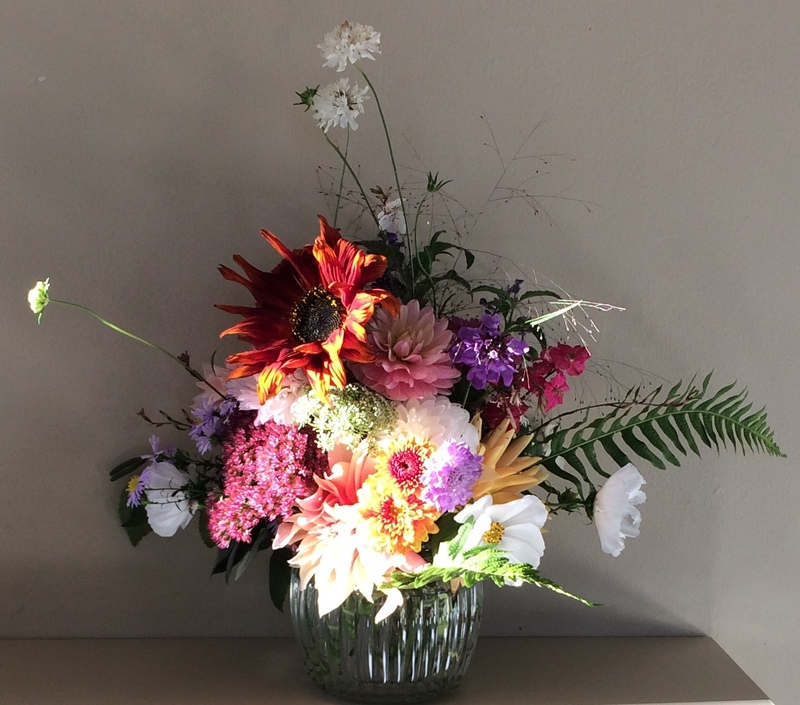 Together with my Mum, Sue made up some incredible displays for tables and plinths, all using home-grown stems. Plus she made beautiful bouquets for myself and my two nieces, and some seriously impressive buttonhole work. Note the use of hops and clematis seed heads for a bit of country chic. 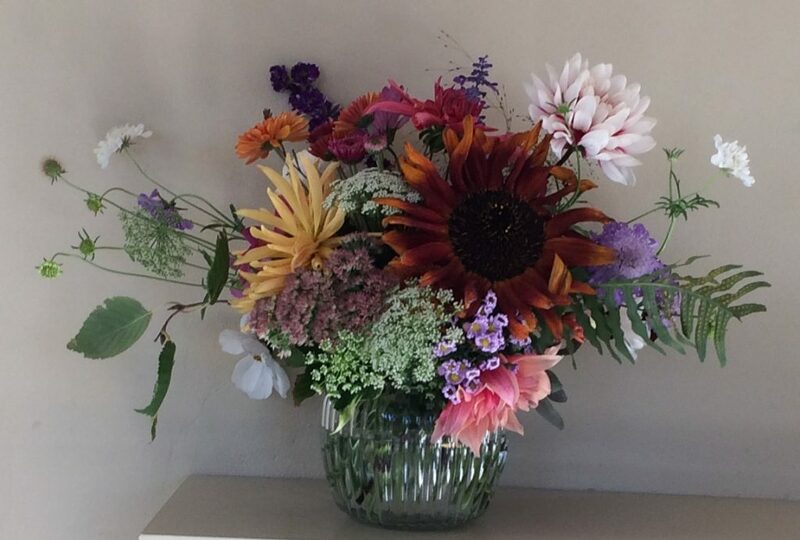 If someone is thinking of doing their own wedding flowers I would say do it…but only if you have a talented team to do all the work. 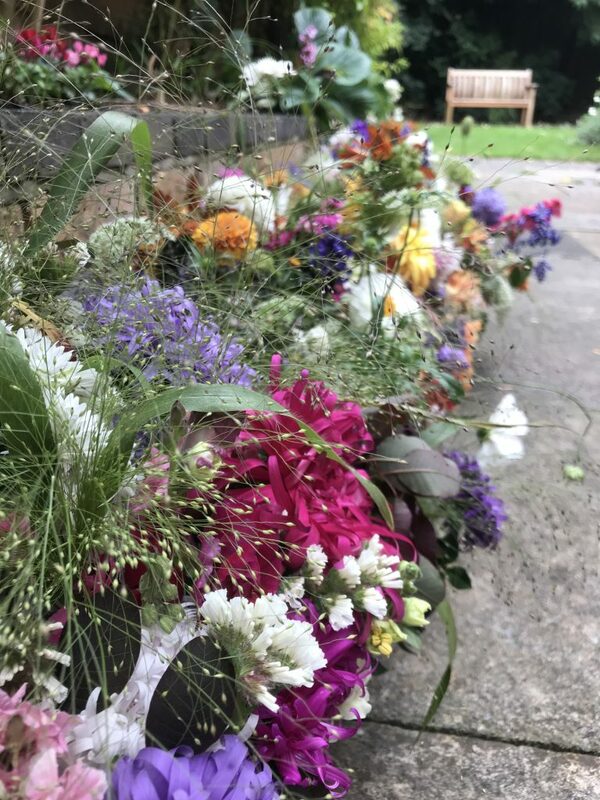 If I was arranging flowers at the same time as making sure the bar was in order and the caterers were OK and having my hair and make-up done, I would have collapsed in a heap. 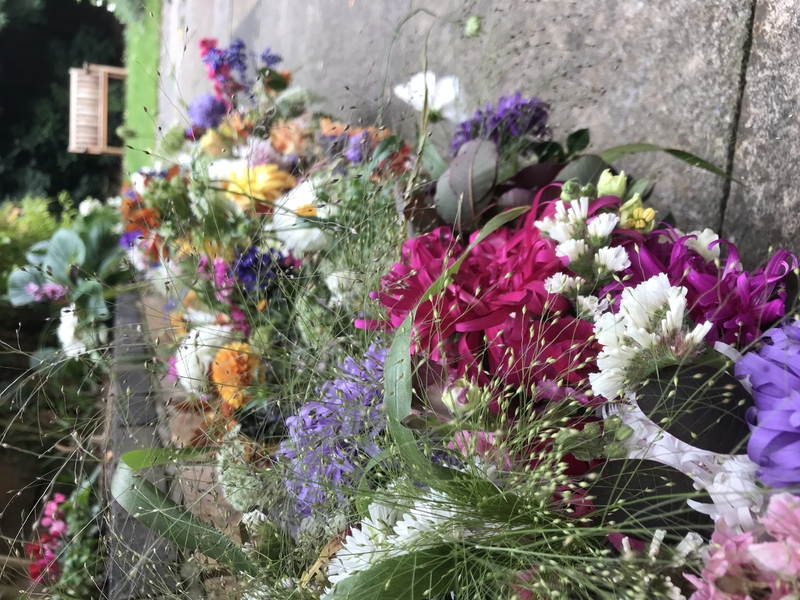 So all respect to Sue and my Mum for their extraordinary skills – I don’t use those words lightly; I couldn’t have asked for more on the floral front. 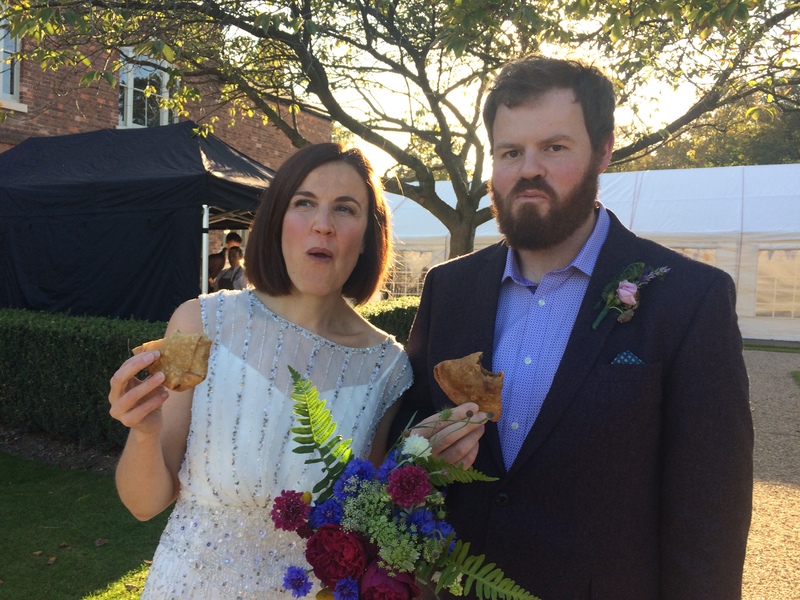 As someone who has never wanted a big wedding, let alone a bit formal wedding (ugh), it was important to me that we included as much of our normal life into the day as possible. Normal life in Bearwood means regular trips to Chandigarh sweet centre for samosa – THE best samosa in the region – and it gave us great joy to pile 300 onto MDF boards for after-ceremony snacks. Normal life also meant Matt messing about with massive bits of wood – this time by sticking our heads onto temporary exhibition walls – and me organising this event like any other work event that I’ve ever been involved in (cue production schedule, production budget, and various bits of tech). I digress. 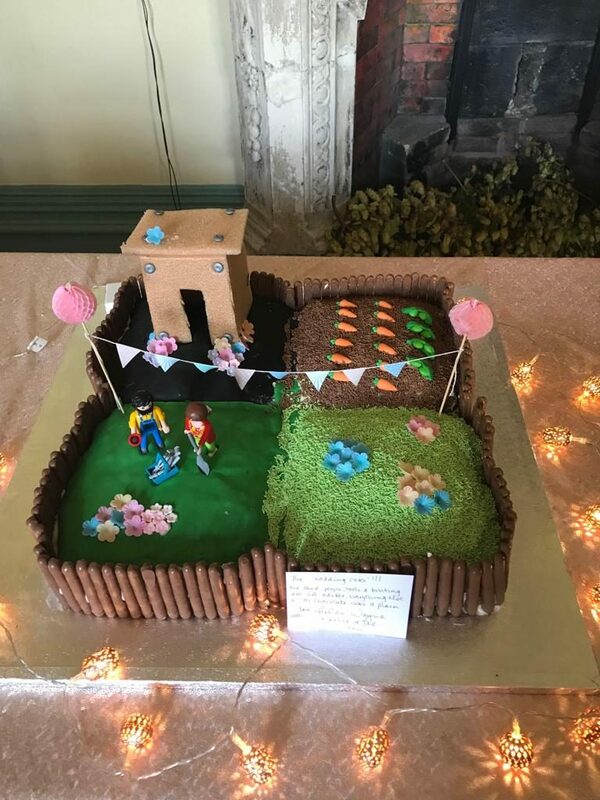 The other noteworthy creative skills were from our bakers, and in particular Helen Annetts (my work sister) with her epic allotment cake. 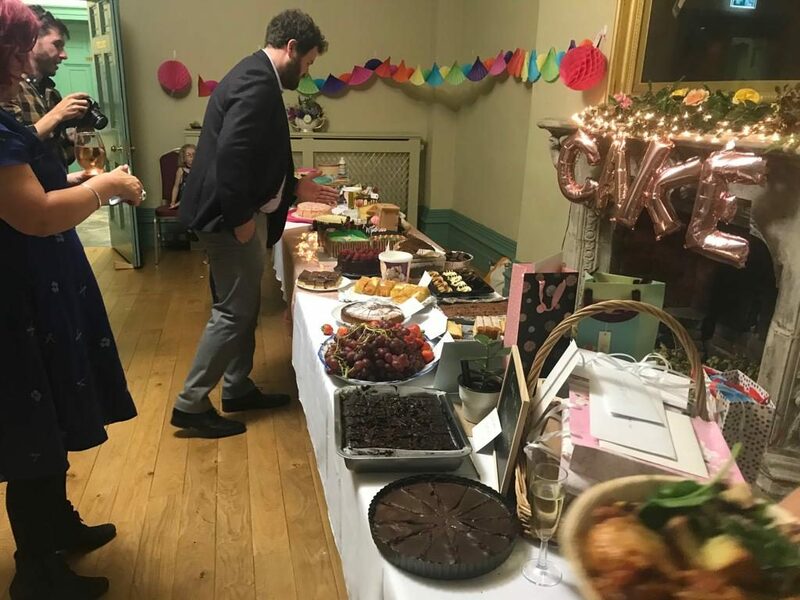 I didn’t want a regular wedding cake so Helen “volunteered” to have a go at making a novelty cake – as it turned out, a brilliant centre piece to our table of cakes, generously brought along by our guests for the best pot-luck dessert table I’ve ever seen. Why have one cake when you can have 30? So now we’re holed up in a farmhouse in Cornwall, looking forward to life getting back to normal and introducing Harry to the joy of October beaches and cream teas. 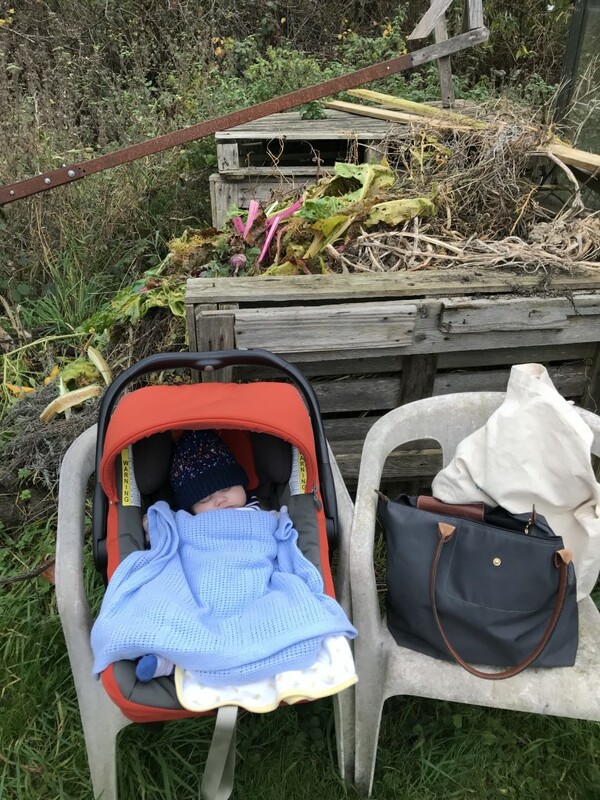 In the two-and-a-bit months since the baby was born, the allotment has gone from high summer productivity to sodden and vaguely overgrown. 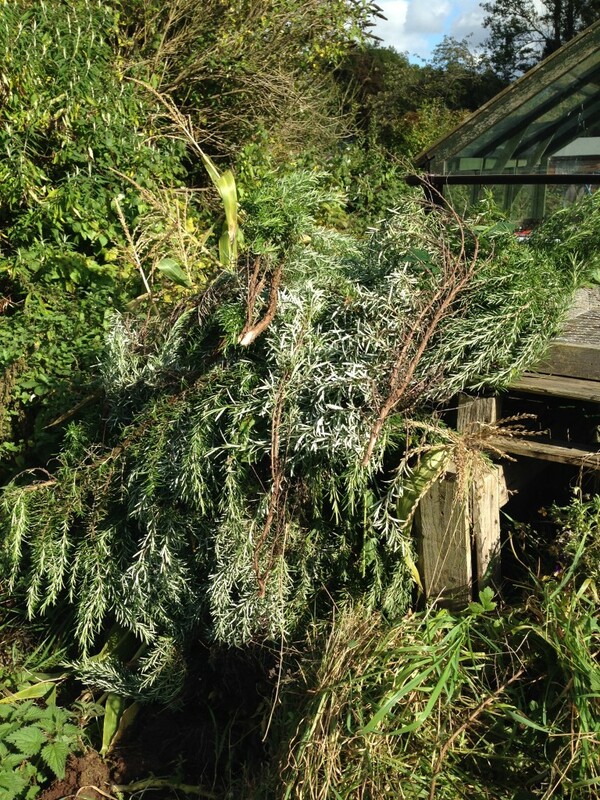 The so-called compost bin is overflowing with the debris of the season, sunflower stalks, hop vines and mouldy chard. 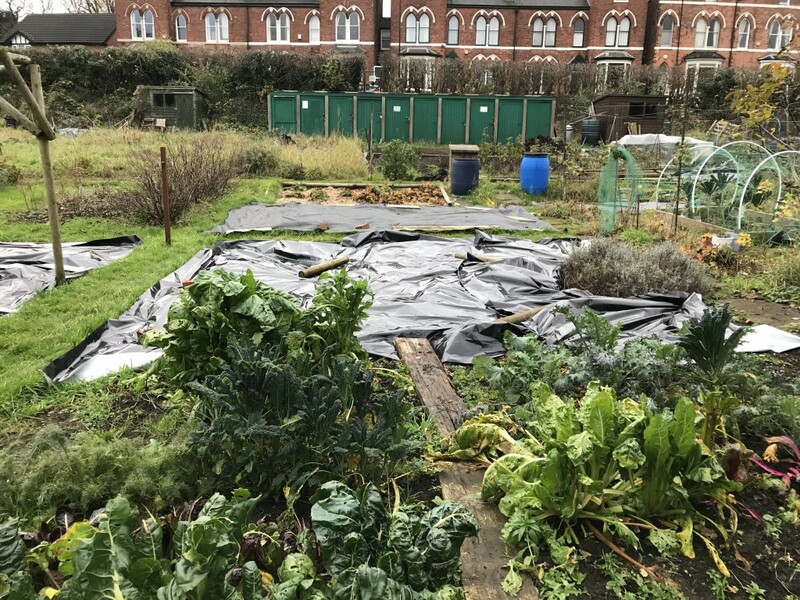 The veg patches are green with weeds and the fruit bushes are bare saved for the buds of new life, already visible on the branches. 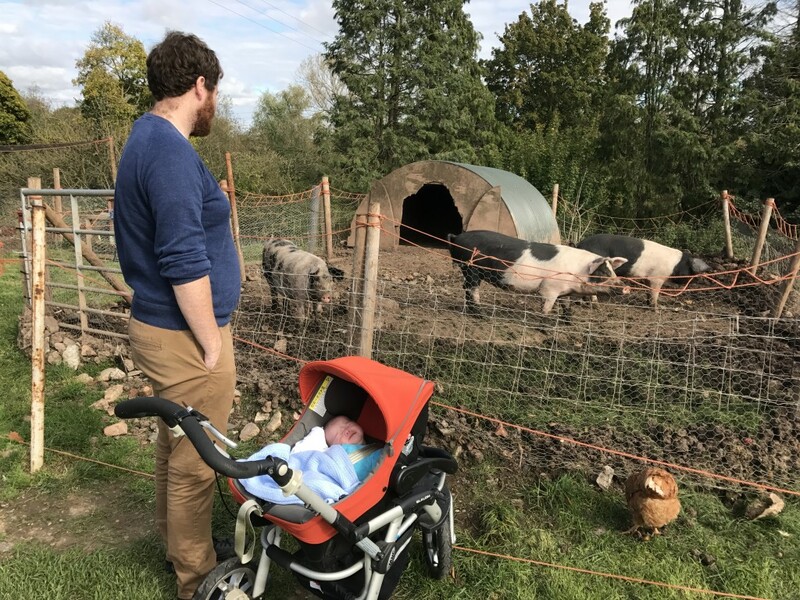 I pop down when I can for a spot of tidying – the success of this depends entirely on what mood Harry is in, and how much sleep I’ve had (or not had) the night before. 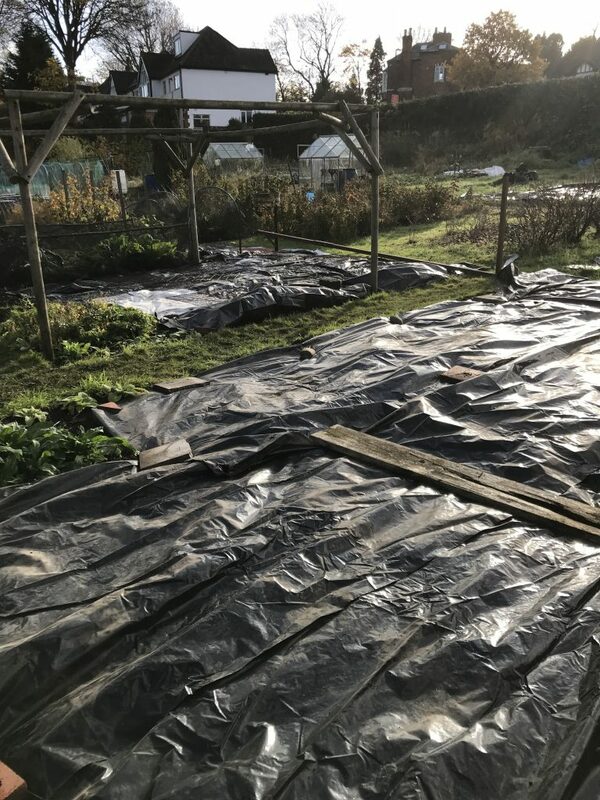 I’ve covered both of the main beds with black plastic, partly to keep the weeds down over winter but also because I don’t know how much I’ll get around to cultivating next year. 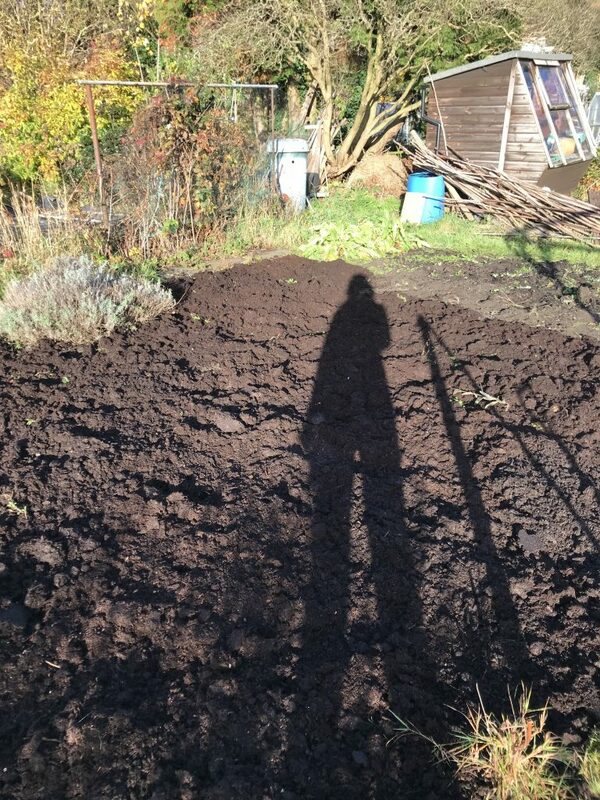 Left uncovered this soil becomes a carpet of weeds in a blink of an eye; this is a case of an hour’s work now saving me serious amounts of graft come spring. 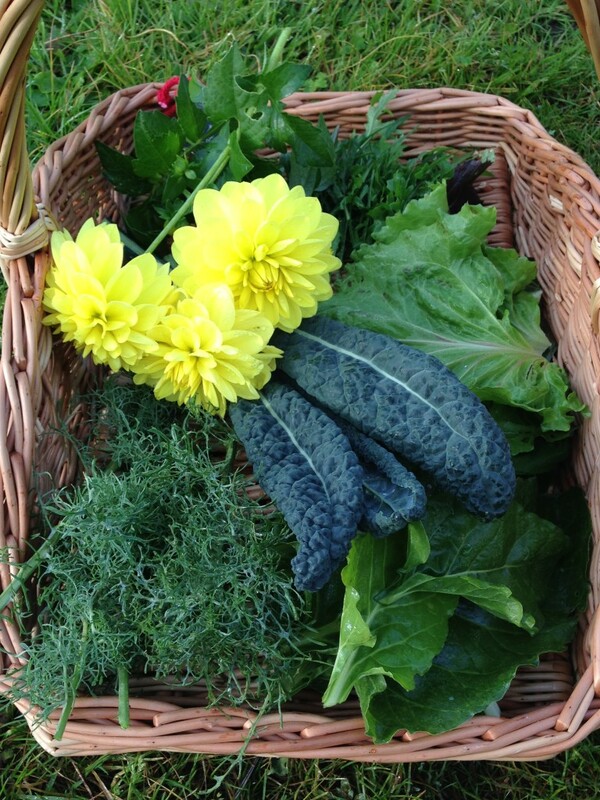 There’s not much to pick now but the cavolo nero is still going strong, as is the kale and chard. What I do have though is a serious pile of pumpkins; having served their time as Halloween decorations, it’s time to transfer them to the pot. This is an easy curry that I have shamelessly pinched from Nigella Lawson, though in truth it’s more the kind of dish I’d expect to find on a yoga retreat than from a ‘sleb chef. It’s vegan (shock!) and cheap (horror! ), and more to the point I am able to cook up a massive vat of it in the few minutes that the baby is asleep in the afternoon. If you’re not lucky enough to have a pumpkin pile at home, use butternut squash instead. 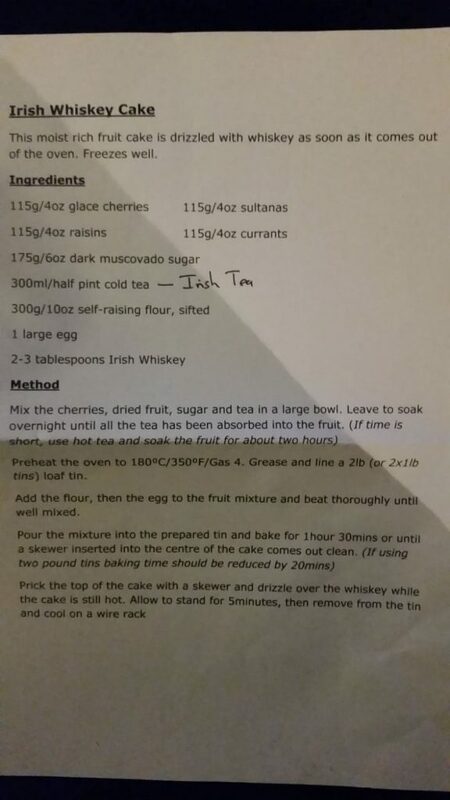 Recipe adapted from Nigella Lawson. Makes loads, about 8 portions. First, make the curry paste. In the food processor, whizz together the onion, chilli, ginger, garlic, turmeric, coriander, cinnamon and stock cube, adding a splash of water to help it combine if needed. In a large casserole or stock pot, warm the oil over a medium heat and add the curry paste with a pinch of salt. Fry for a few minutes until the oil begins to separate from the paste. Add the solid coconut cream from the top of the tin of coconut milk, fry for a few minutes more, the add the rest of the coconut milk and tomatoes. Swill both tins out with water and add to the pan. Finally slide in the sweet potato and squash, bring to a gentle simmer, and cook until the veggies are soft – about half an hour. Some of the squash will disintegrate into the curry, which helps it to thicken. Season with more salt and lime juice to taste, then serve with brown rice and a dollop of yoghurt. 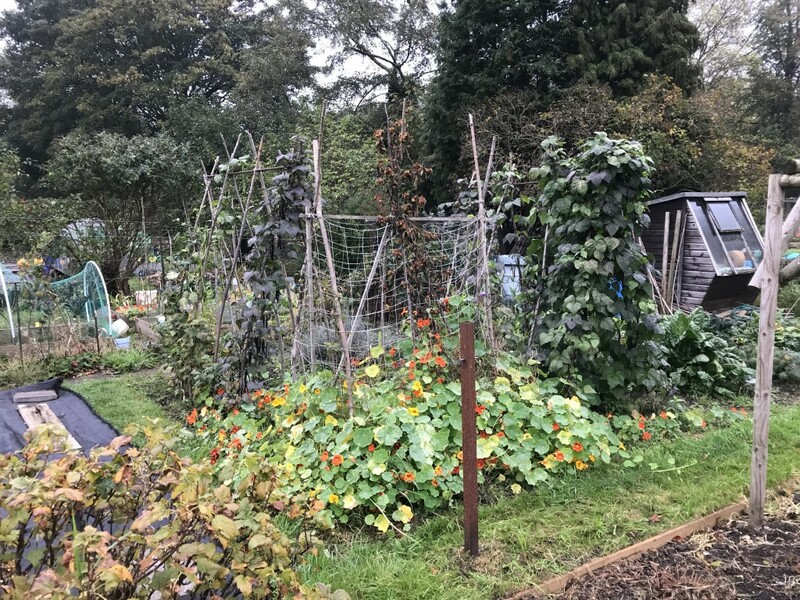 The allotment has turned into a jungle in my absence – I find this very stressful but have decided it’s good practice in learning the art of going-with-the flow. 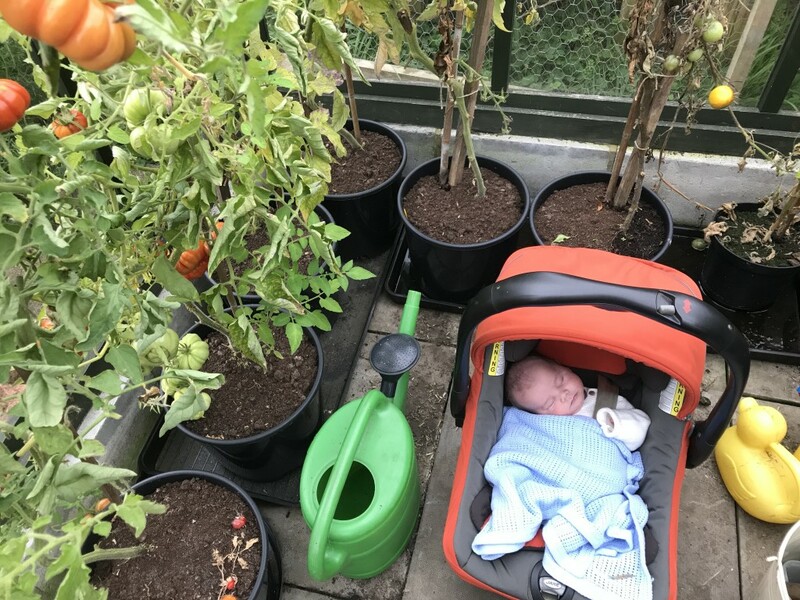 Harry’s visited a few times, hanging out in the greenhouse whilst I harvest and weed. 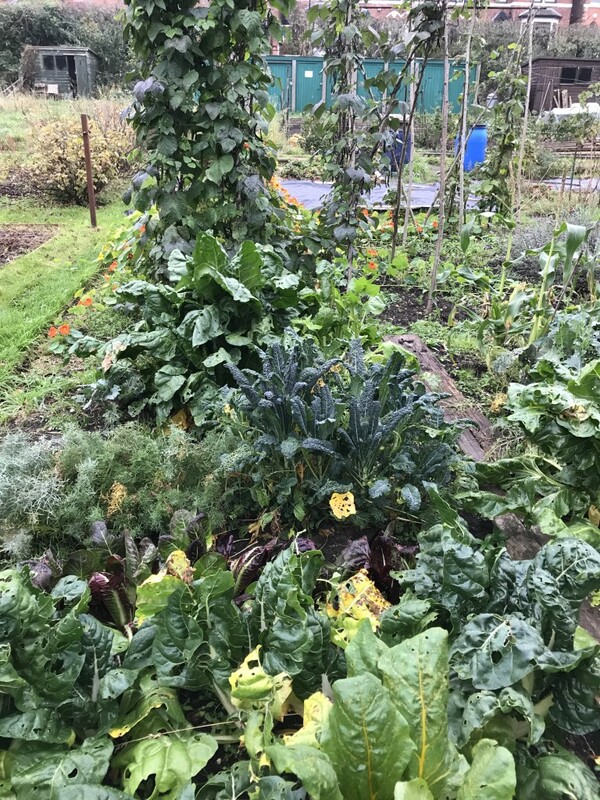 The annuals are finished now but the greens and purple beans are still going strong – they are surviving slugs and caterpillars and whitefly and weeds. 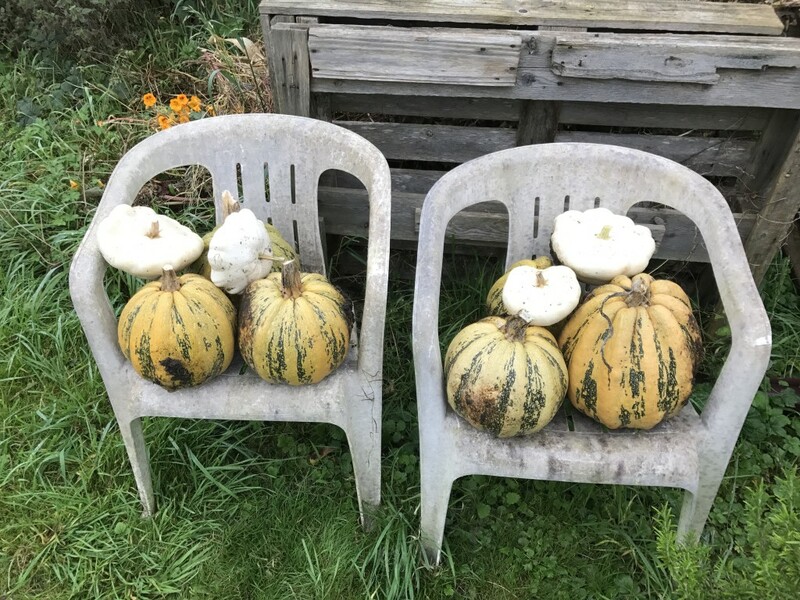 The massive foliage of the squash patch has died back to reveal a treasure-trove of striped fruits, just in time for Halloween, and the self-seeded nasturtium are threatening to take over completely. 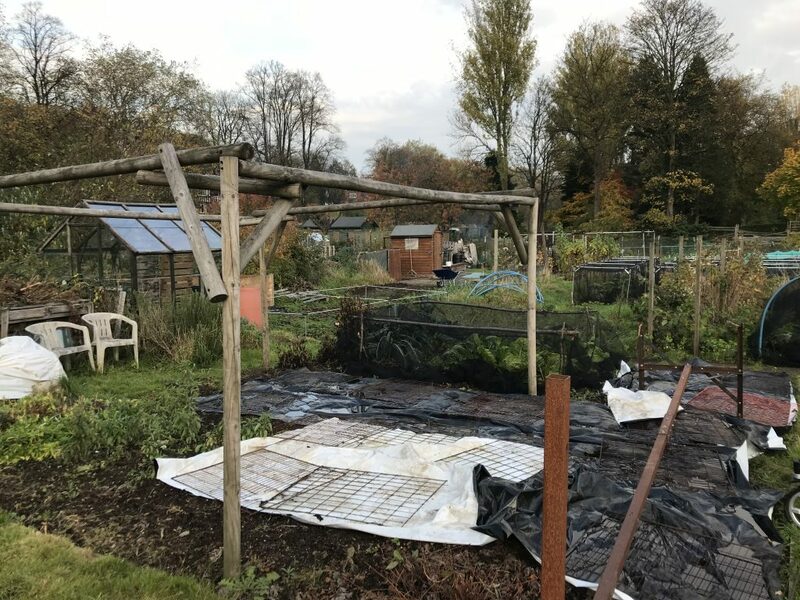 All those summer months of prodding and weeding, but it’s taken two months of no intervention for much of the harvest to come good. The autumn clean-up has started veeeerrrrry slowly. 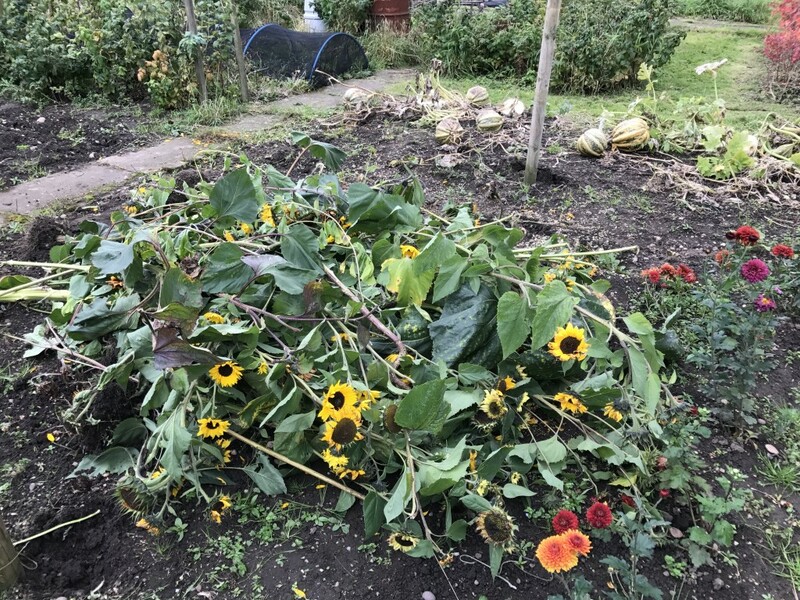 The sunflowers and cutting flowers have been taken up and that’s about it. In the last two months the greens have become a weeded jungle. Mega chard, mega spinach, massive beans. The light is softer now and the air damp. 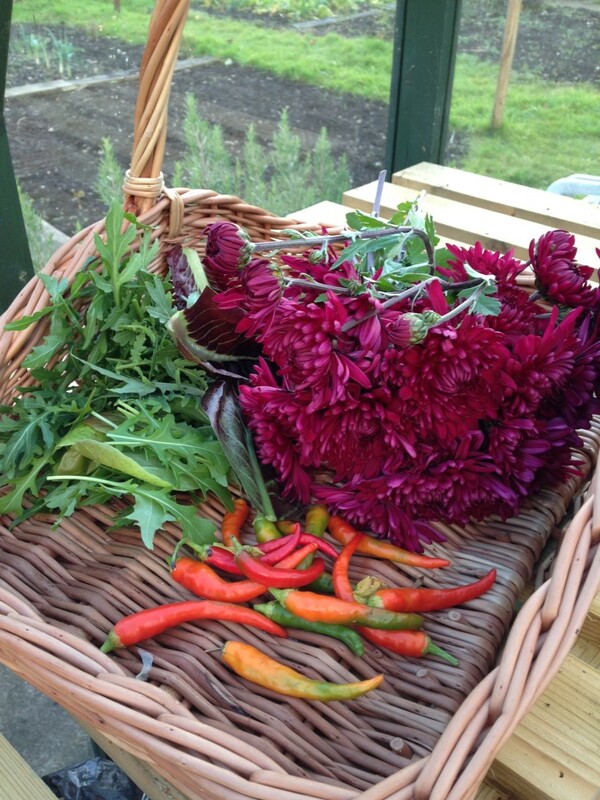 Small trips to the allotment provide a brief respite from the house, thirty minutes of quiet time. Jobs to do: Oh Lord, EVERYTHING needs tidying up. 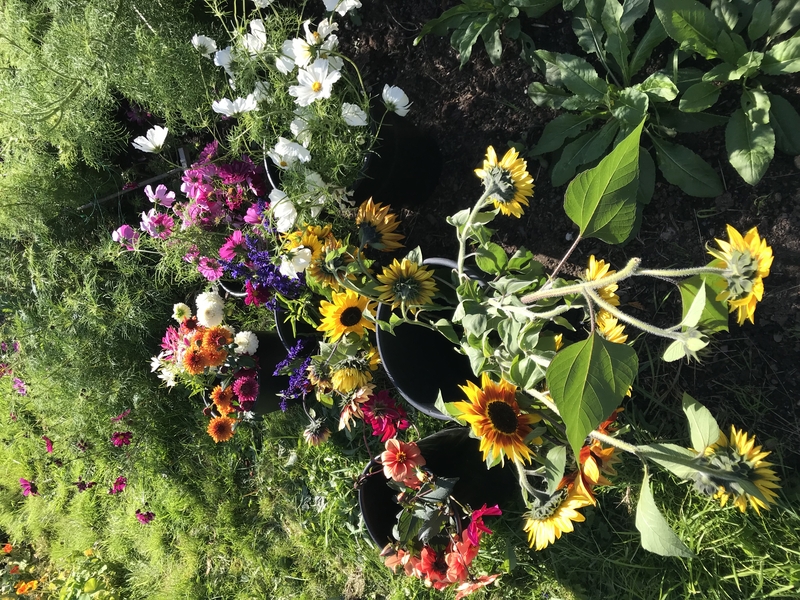 I have been ‘encouraging’ Matt to make me a snug box to keep my chrysanthemum plants for over-wintering, but it’s been coming to naught. He’s been leaving the house at 6am and rolling home at 8pm, smelling of wood and glue and enthusing about the set he’s making for a theatre in town. So just like replacing the boarded-up window and putting all our art on the wall, the chrysanthemum box is at the bottom of the To Do list. 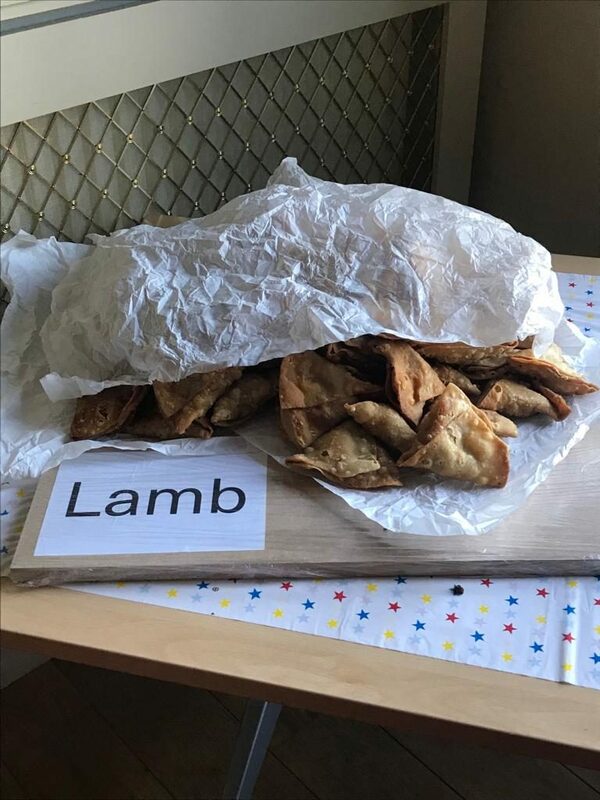 But then the other day he popped to the Original Patty Men to drop some stuff off that his friend Matt had made for them (another bearded fabricator with a wickedly dry sense of humour. 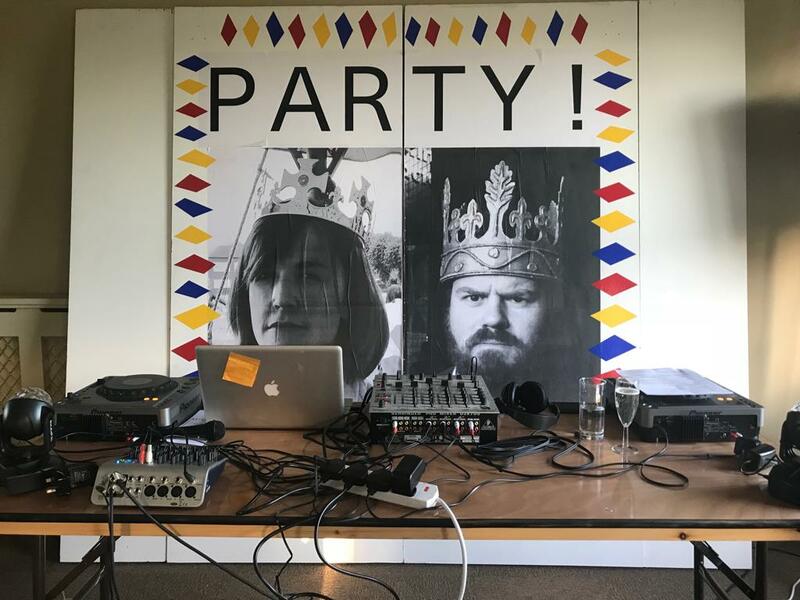 They share a name, a profession and a workshop. Keep up.) For those not in the know, Original Patty Men are one of the hippest places in the city right now – their Twitter description is ‘purveyors of filth’. Think burgers, craft ale and beards that reach down to navels. Anyway, the cool OPM chaps have happily gifted my man with an insulated polystyrene crate, the kind that meat and veg get delivered in. So now the chrysanths have somewhere cosy to over-winter, just like Grampy has instructed. 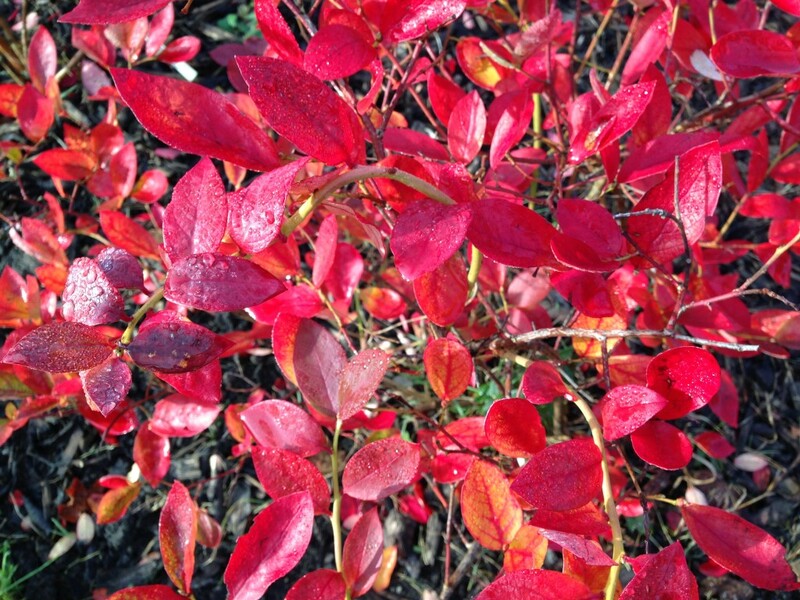 Good timing too, as the first winter frosts are taking hold. 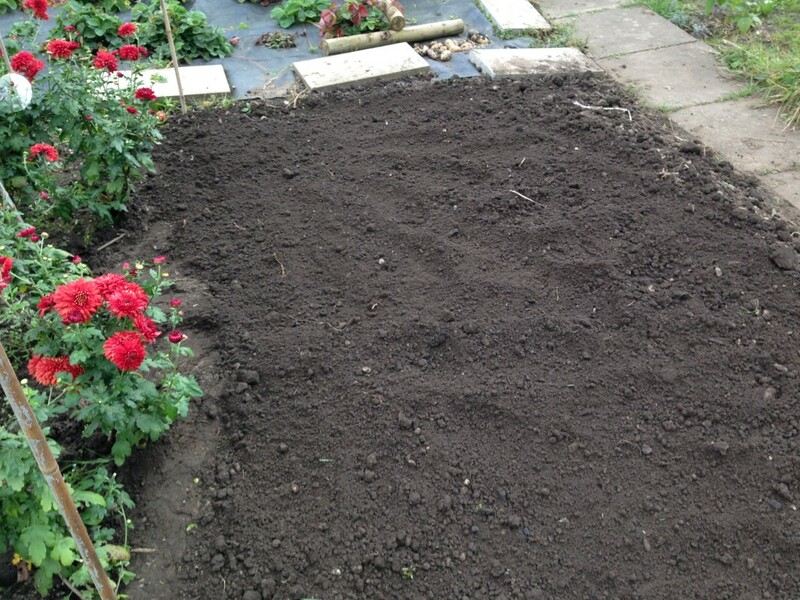 As soon as it stops raining, I’ll head out and dig up the browning stems. 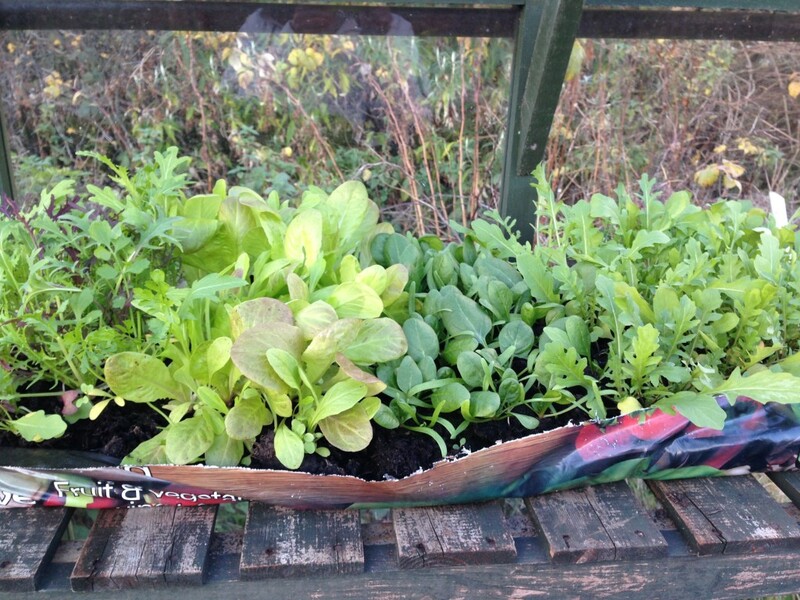 In the meantime, I harvest the last blooms of the year, alongside a few bedraggled chillies and, pleasingly, tiny winter salad leaves: rocket, mustard, spinach. 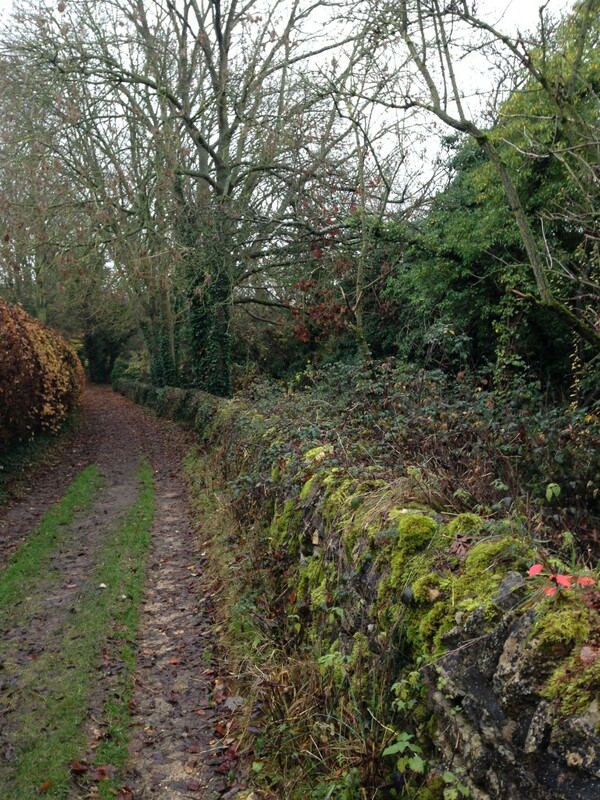 We took much-needed time out this weekend for a bracing autumn-winter walk down Worcestershire lanes. Autumn came late this year and I don’t think it will last long. With the Christmas lights being switched on, and stormy weather, it seems that we are on the brink of season’s change, once again. Well yesterday was a bombshell moment wasn’t it? We were awake from 3am, periodically refreshing the news feed on my iPhone, despite knowing that news-checking would only increase the sense of impending doom. I did expect this outcome, surely we all did: the “cry of the forgotten man” has been a regular refrain in the post-Brexit referendum analysis and in this age of globalisation, it is a cry that is being felt across the Western world. 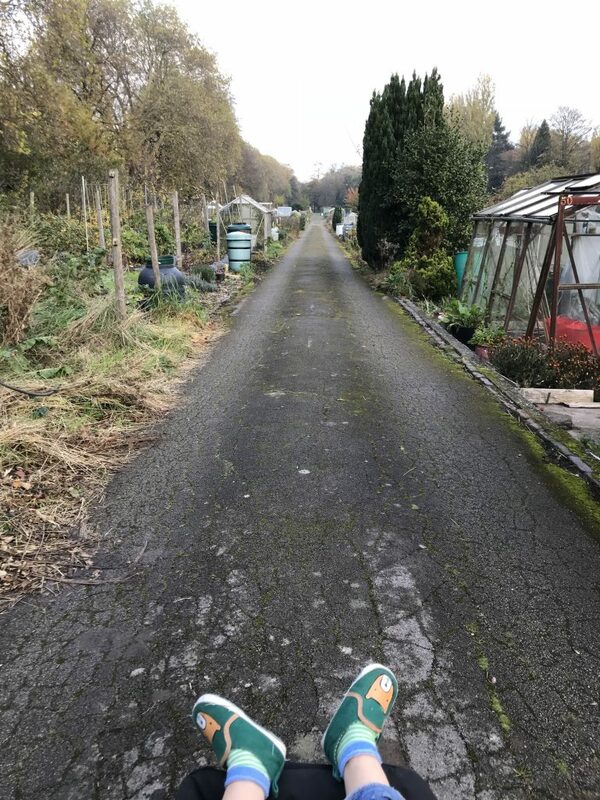 Whilst some people are benefiting from the modern age, so many others feel left behind and the result is an existential crisis that is playing out through society, politics, the media. My sister-in-law (American but living in London) declared that both countries of which she is a citizen have taken crazy pills. The news today tells us that more people actually voted Clinton than Trump. A nation is divided and it has an impact on the entire globe. On this side of the Pond, we have to watch and wonder what new order awaits. I have been reading several books lately that were written in the 1930s: some novels, some gardening books, a few memoirs. Yesterday morning, I got to thinking: what must it actually be like to live a time of even greater political uncertainty? Of actual war? With hate speech in the air? What could the ordinary person do to keep themselves sane? And the answer is there in the books*. They got busy. They looked after their own, got their hands dirty, did normal, elemental things to remind themselves of goodness and rightness. 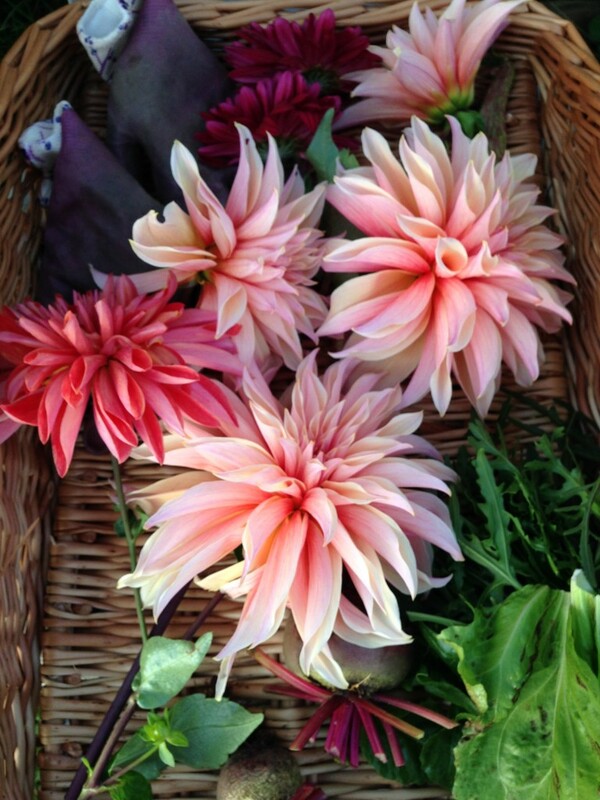 So when there was nothing else to be done, I headed to the allotment and took up the dahlias, now stunted by the first winter frosts. 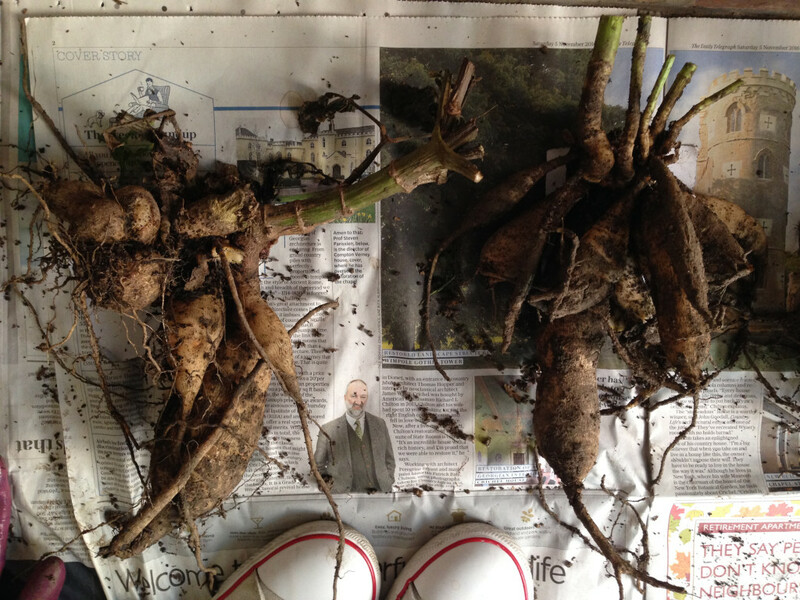 The tubers will go into dormancy, over-winter indoors, and then I’ll plant them out for a new life next spring. Now it’s grey outside, hailing in fact. But there is always knowledge that spring will come. * These books are: Diary of a Provincial Lady by E.M.Delafield, which is a much, much funnier book than it sounds and worth a read; various novels and gardening literature by Vita Sackville West; and Country Matters and Four Hedges by the extraordinary Claire Leighton. Books on a similar theme (daily life in a time of political extreme) include Alice B. Toklas’ Murder in the Kitchen, which records her life with Gertrude Stein in France during World War One, and the masterpiece, Honey from a Weed by Patience Gray, telling of life in some of the poorest villages of post-war Europe. It’s darker (but not that cold), summer has undeniably gone but winter has yet to take hold. Autumn’s grasp sends the city golden, with grey misty mornings giving way to glorious afternoons of sun that shines through the burnished trees in the park, illuminating their branches. Stuck this morning in traffic, I watched how a gust of wind sent yellow leaves flying from a sycamore, each twisting in its descent to resemble a flock of exotic birds. 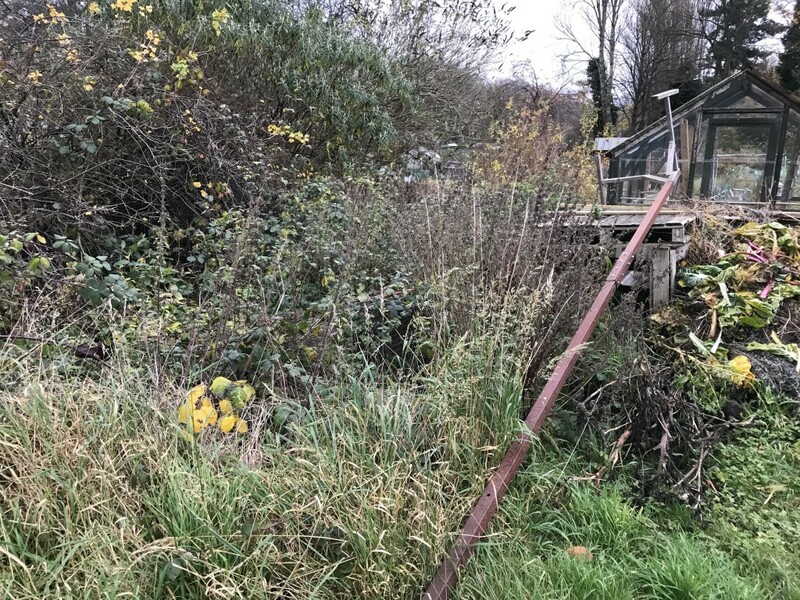 It’s a good time to get out into the natural world, although on the allotment things are quiet. 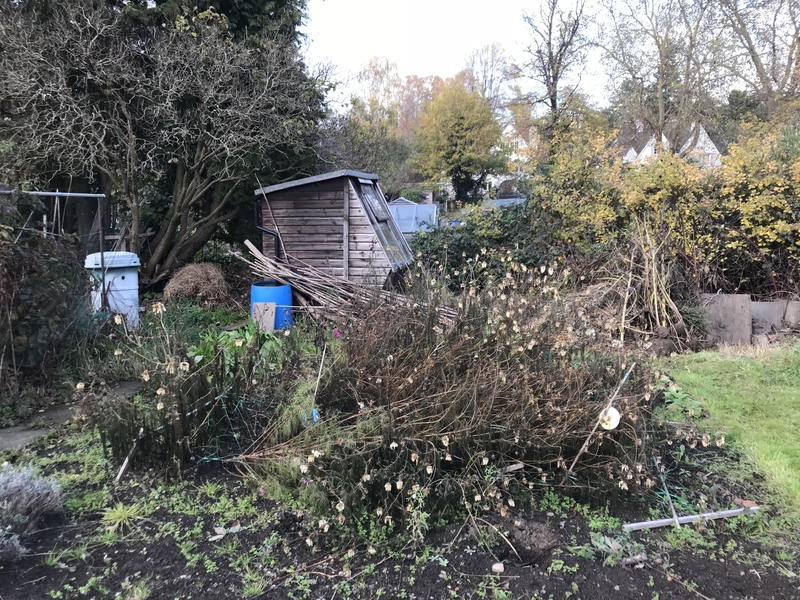 I’ve been busying myself clearing the back garden of our new house – getting to know our thin soil, sifting through the broken bricks, tiles and glass left by a builder many years ago. It’s not a pretty job, but it will reap returns in the long run. 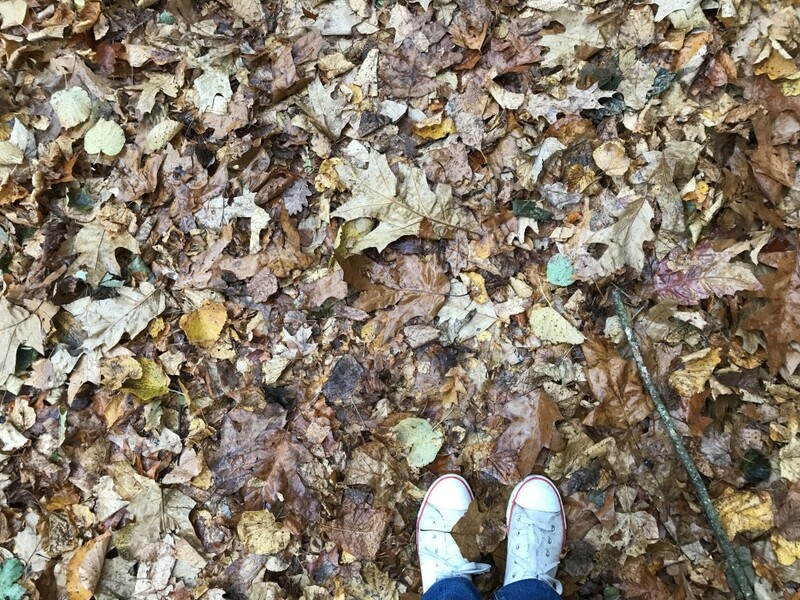 So there are few words this week…just a reminder to take a moment and absorb the gloriousness of the passing season. Suddenly, there are apples everywhere. 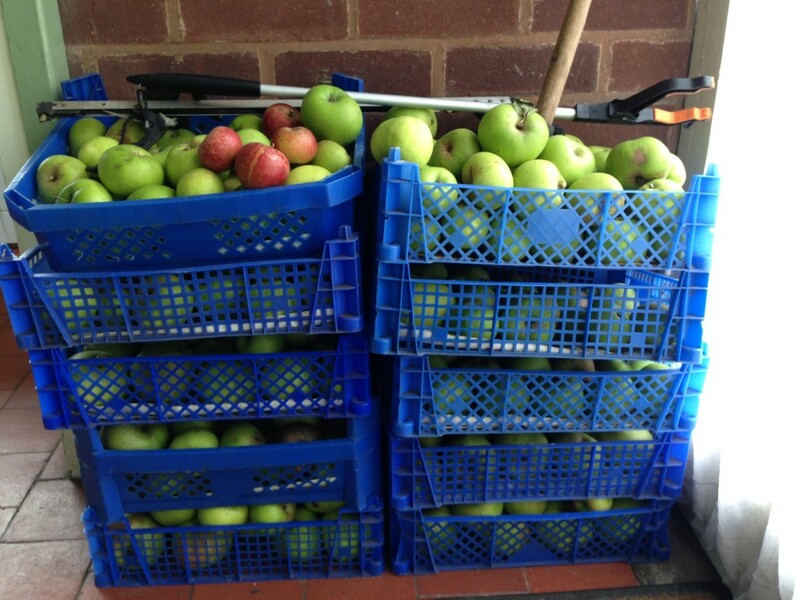 We visited Matt’s 90-something-year-old Grampy at the weekend and the first sight on entering the house was these stacked apple crates, plus a sign at the front door claiming apples for sale. I make a mental note to track down a recipe for the Dutch apple cake that I saw in Rotterdam back in May, generously crammed with fruit and topped with cinnamon-spiked crumble. 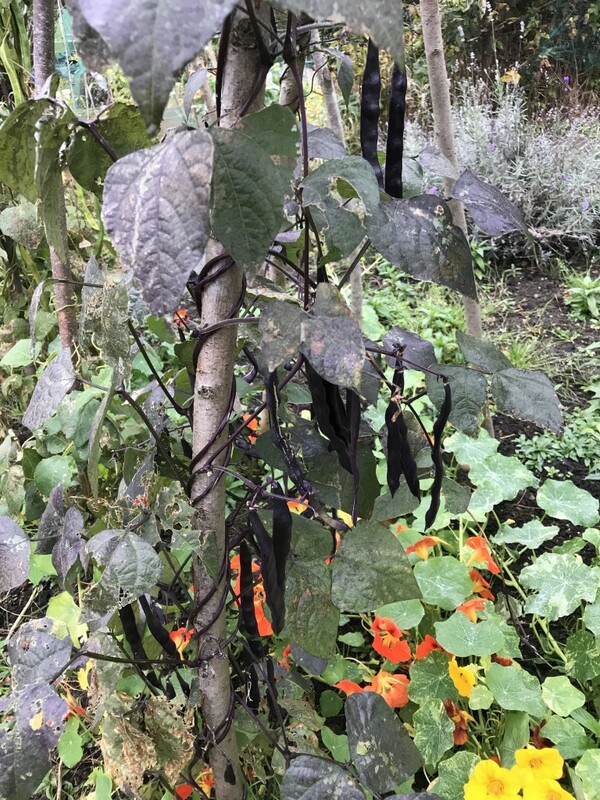 Against all odds, the borlotti beans have come up with a bounteous harvest and I picked a carrier bag-full of marbled pods yesterday. 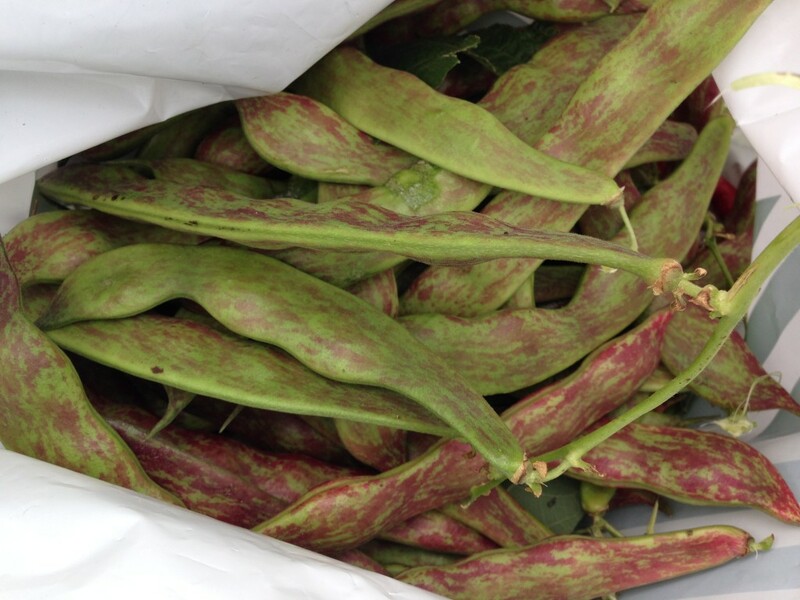 The beans inside are big, around the size of a thumbnail, and milky creamy – I prefer them in this youthful state. 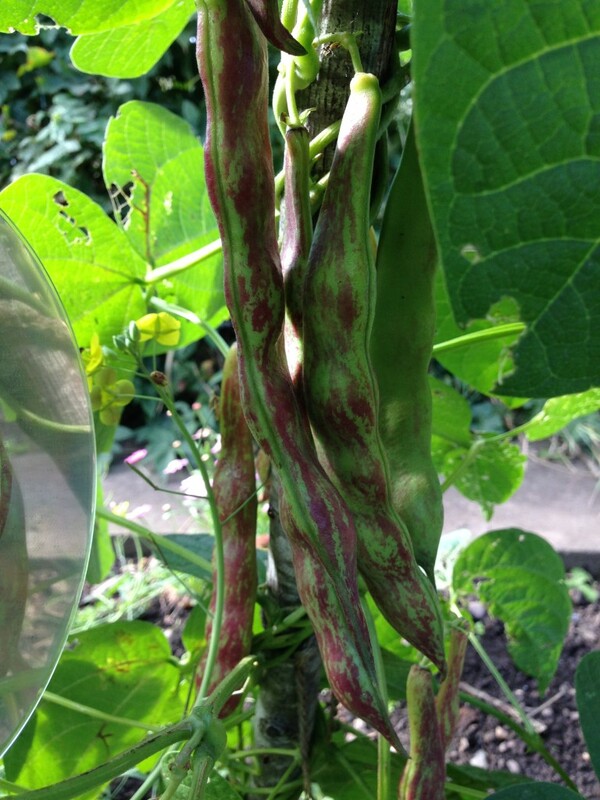 Rather than dry them, I’ll pod these and stick the beans straight in the freezer, ready to be thrown into chillies and minestrone when needed. So much simpler than the usual palaver of soaking and boiling for a day. 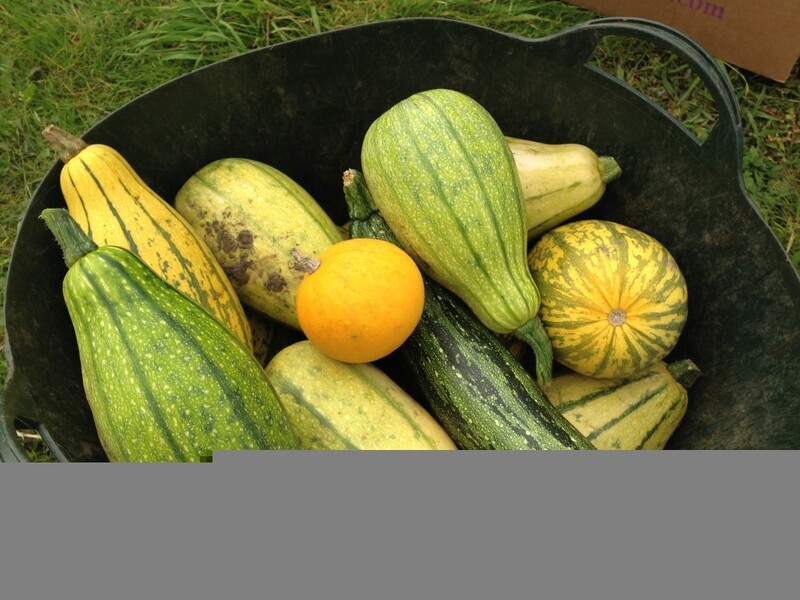 I’ve brought in the ornamental gourds too, in their stripy green and yellow jackets. They’re brightening up the fireplace with autumnal colour. 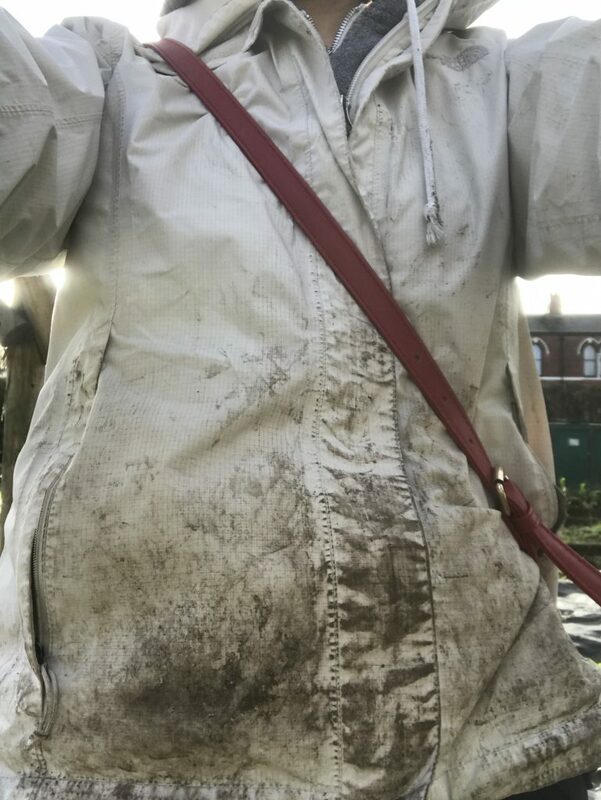 But the real job of the weekend was getting started on the bulb planting. 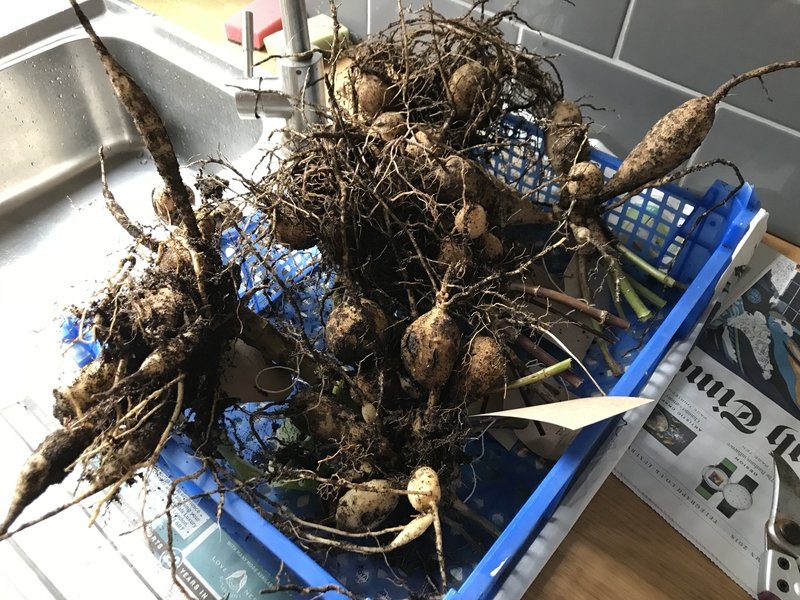 A few weeks back I went a little crazy, possibly after imbibing a sherry or two, and ordered a massive number of tulips, narcissi and allium bulbs for autumn planting. 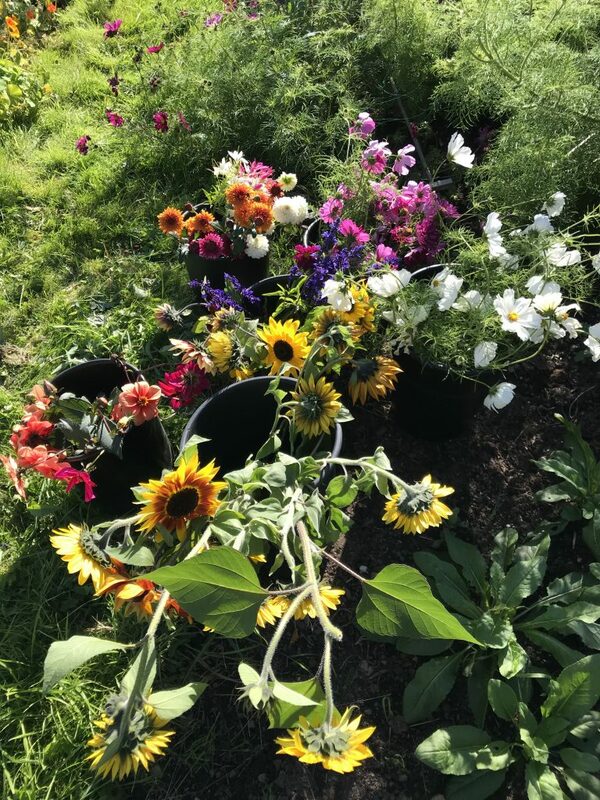 The idea was to have a patch of spring cutting flowers on the allotment that could just sit there all year round, perhaps being over-planted with lettuce or suchlike once the flowers have died back. 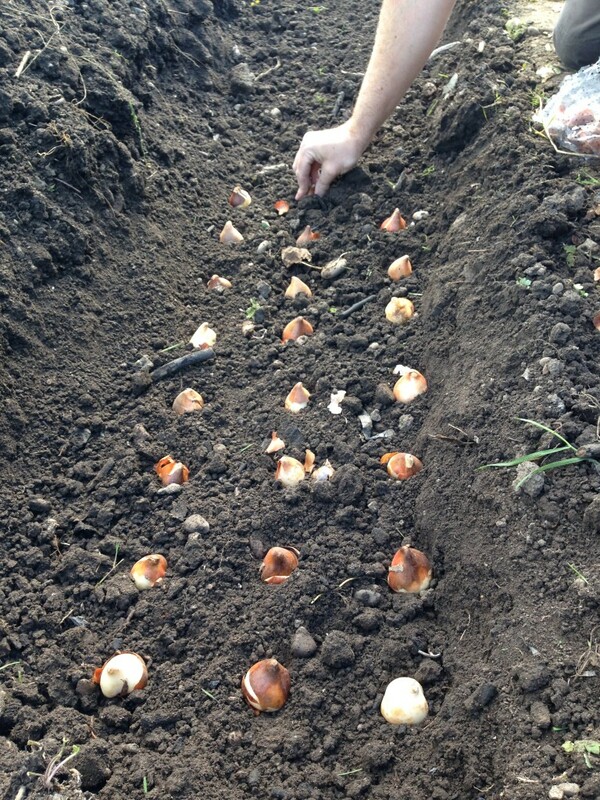 As the bulbs were going into one patch of clear earth, we simply dig out trenches and laid the bulbs out in grids. 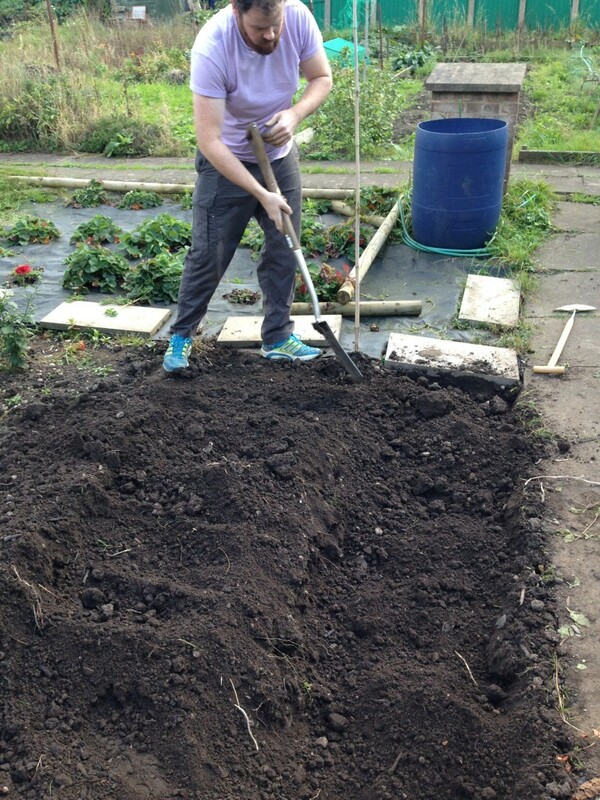 I say ‘we’: Matt did the graft whilst I supervised. The only question now is…will they all grow?! 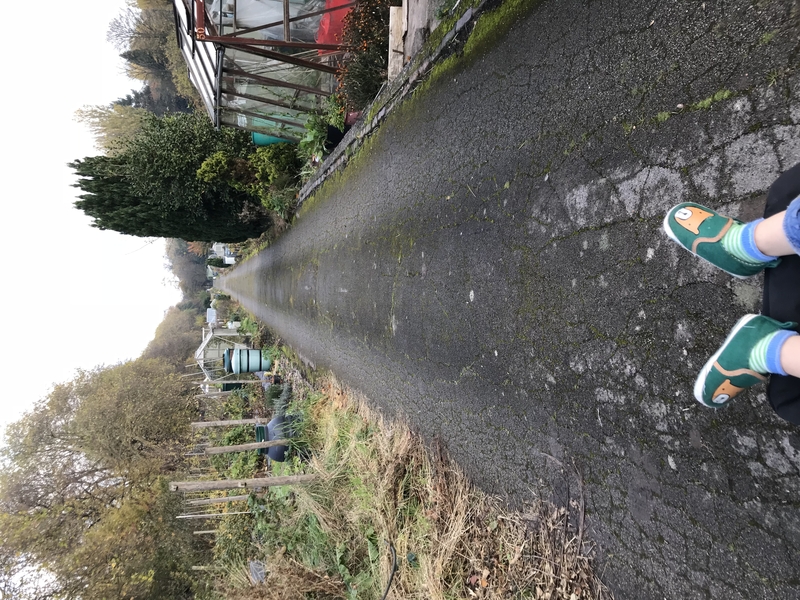 I went home with about 100 bulbs that went unplanted, knowing that there is now no excuse and I MUST make a start on the Herbert Road garden. Thank God, the season has turned. Our new house has turned out to be a Victorian ice-box and I’m having to wear cashmere jumpers in my office to keep the chill off (no hardship there). The bright October mornings start with a bite, the windows are covered in condensation until about 2pm in the afternoon and I’m spotting several local squirrels in the back garden as they build their winter nut store. 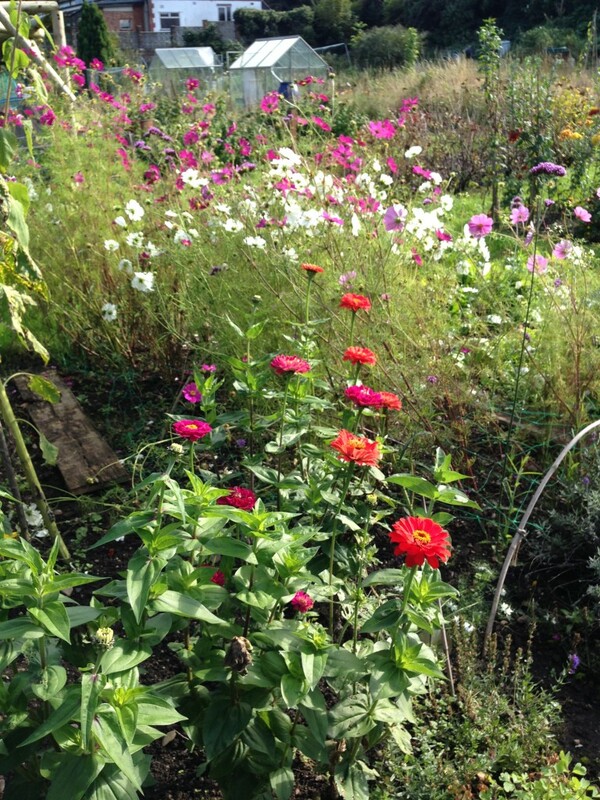 But what a glorious September; bright and warm but fresh. 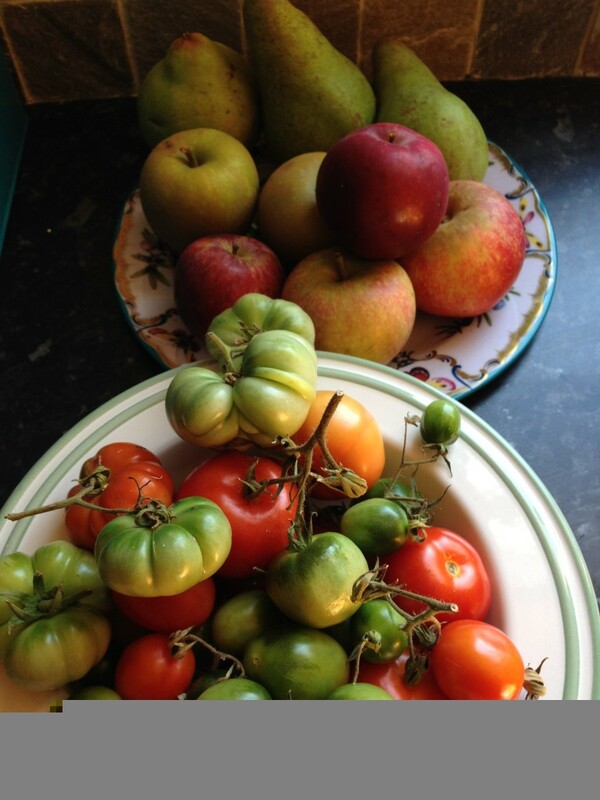 The apple harvest is in full swing and last weekend I filled two carrier bags at Clive’s Fruit Farm – one with cookers, one with eaters – and the fruits are now making a still-life display of voluptuousness alongside the last of the greenhouse tomatoes. 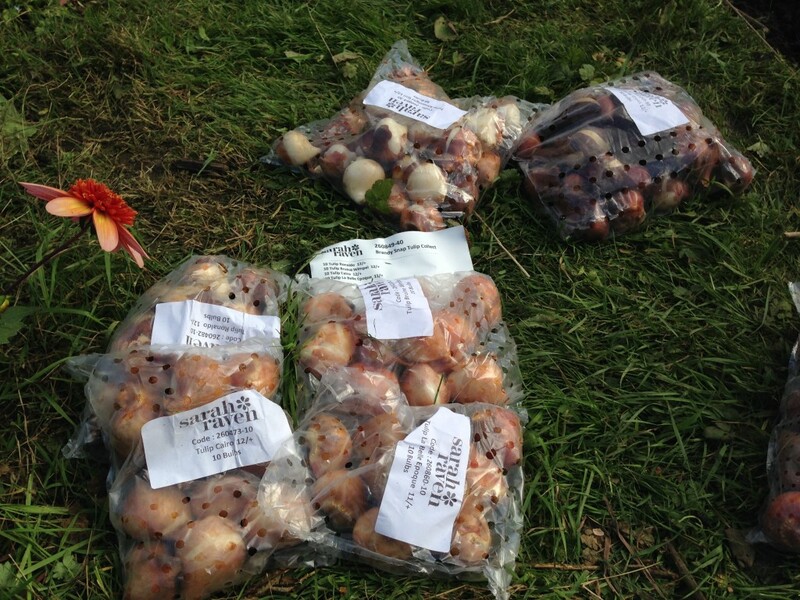 More excitingly, the first of the spring bulbs arrived this morning! I was perhaps a little, erm, exuberant in my ordering: there’s 240 bulbs here with more on the way. I’ve a combination of tulips, narcissi and allium with a mixture of jewel-bright and neutral, calm shade. Most are destined for the allotment, some for the back garden, and some for pots. I’ll keep you posted how I get on. 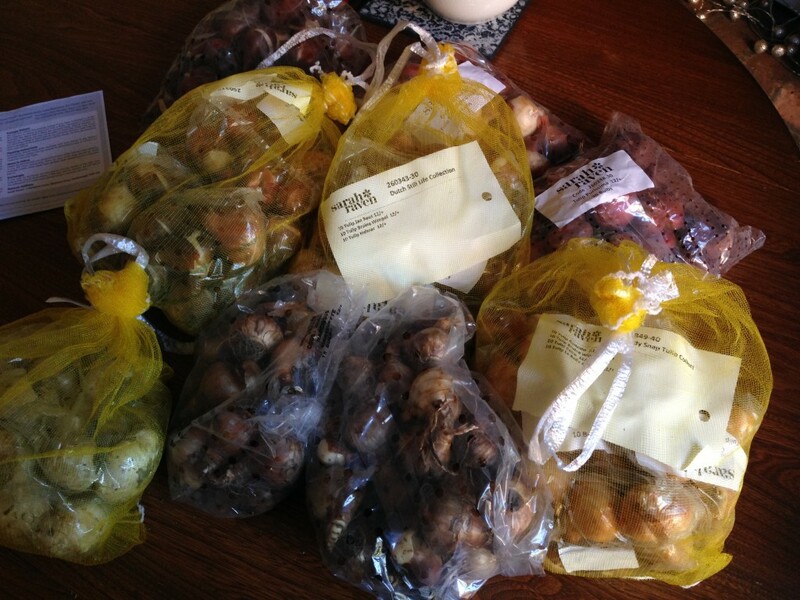 Spring bulbs arrived this morning! 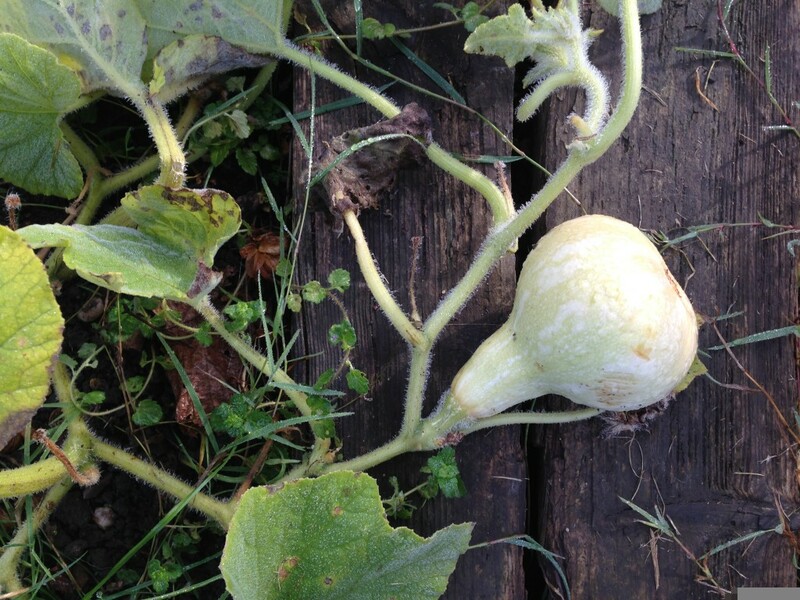 On the allotment, life is slowing down but is definitely not yet finished for the year. 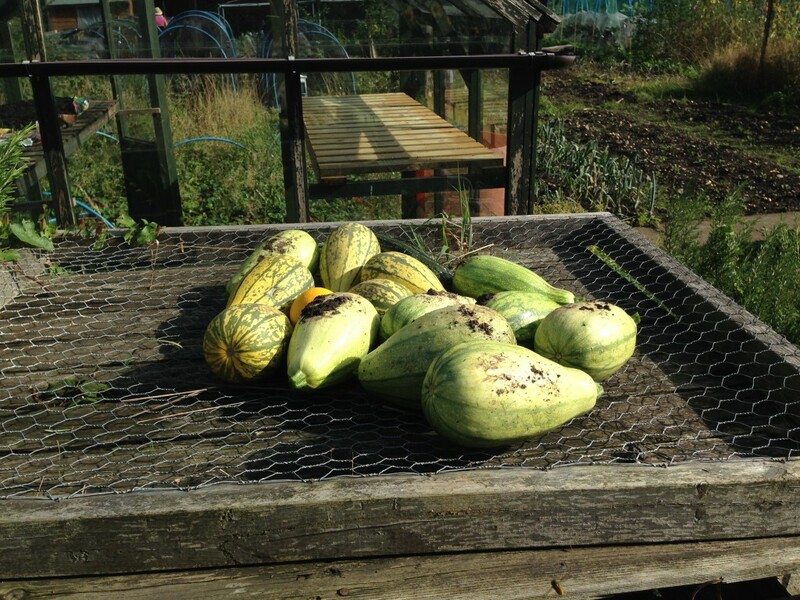 The greenhouse is empty now, other than the final chilli plants, but the gourds are providing never-ending club-shaped green fruit. 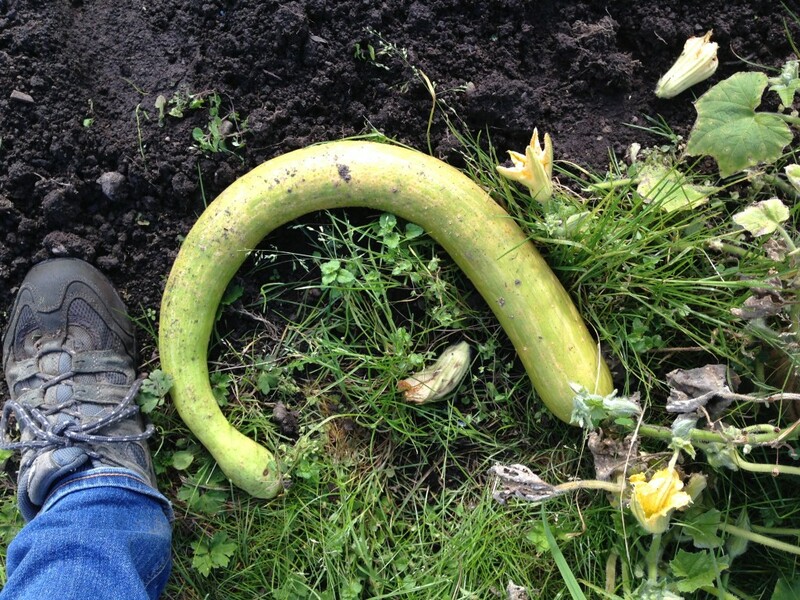 I actually planted a gourd mix but only one type seems to have thrived, and to my mind it is the least attractive, so next year I’ll go back to the drawing board with some properly orange, gnarled and suitably witch-y varieties. 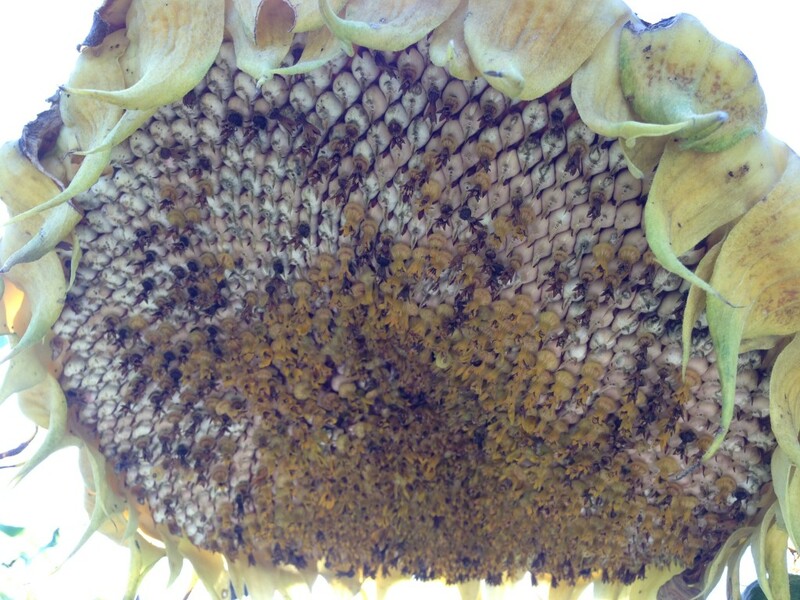 The sunflowers are elegantly dying back but they will stay in the ground for a few weeks for their seeds to ripen. 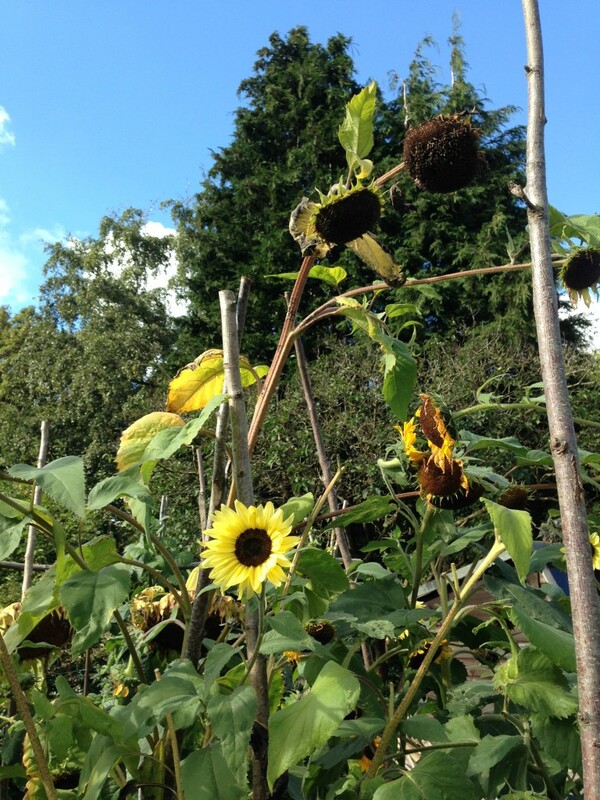 Why pay tuppence a bag to feed the birds when you can grown your own seed-heads for free? I love the statuesque height of these browning heads, swaying in the early autumn wind. 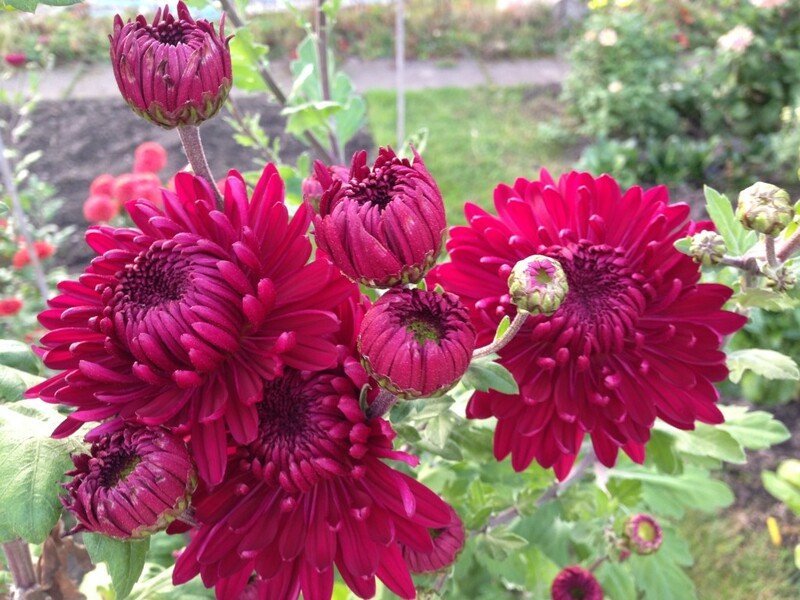 There’s still plenty of smaller blooms to pick, and they’re going in the vase with the pumpkin, bronze and lemon-coloured chrysanthemums. 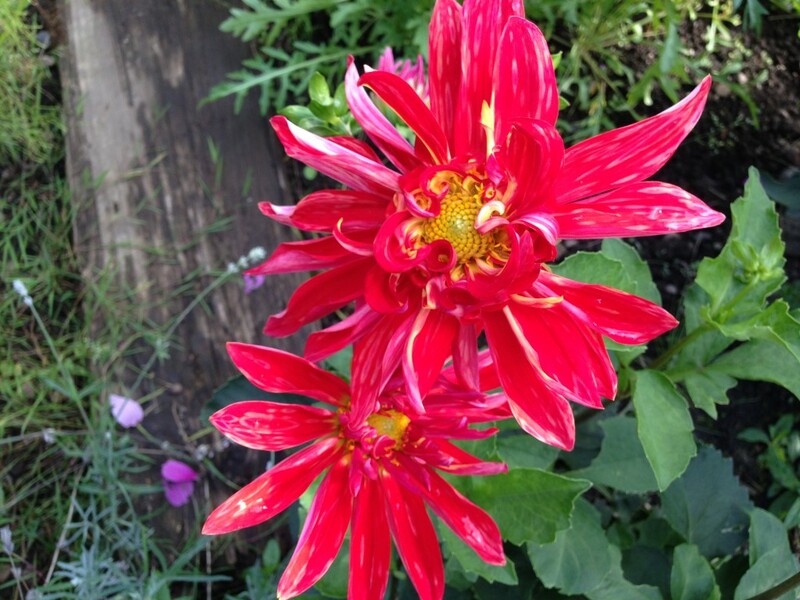 The dahlias are the gift that keeps on giving. In the last few weeks this yellow bloom has popped up: left in the ground last summer to over-winter, it has taken its own sweet time to grow but now that it has, what a shade it is! 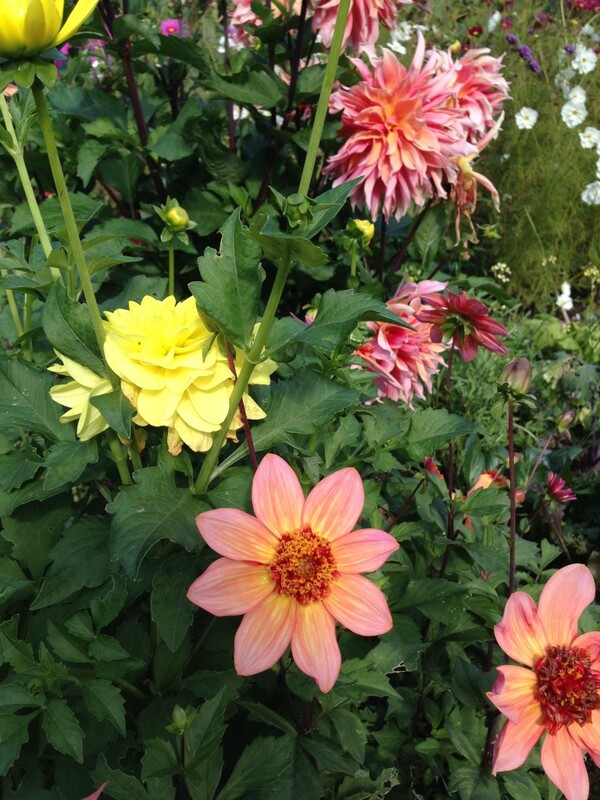 Dahlias Labyrinth (the fat one) and Totally Tangerine (the daisy shaped one) evoke the shades of sunset but Labyrinth, I discover, is an anomaly: it should be a compacted anenome-shape but ours has turned out with a curious mis-shaped centre. There is, of course, great beauty in the ‘fault’. But what is there to eat? 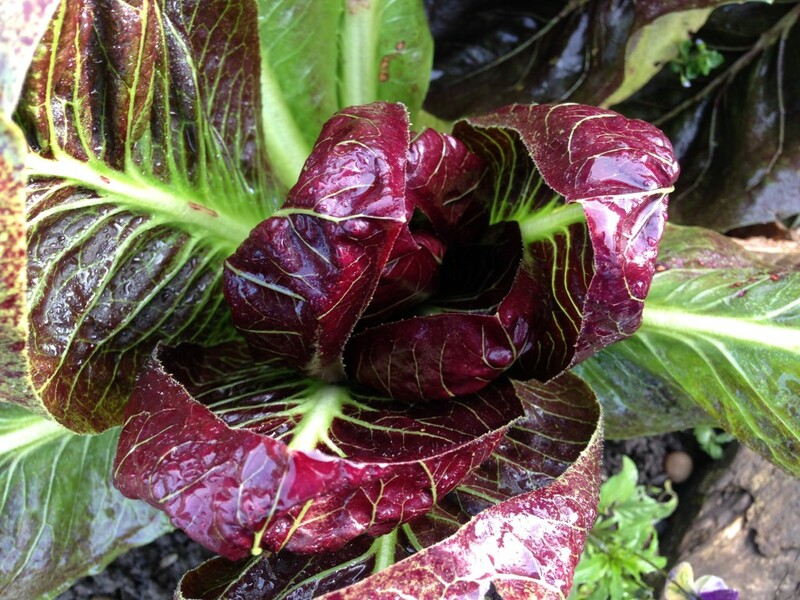 Well, the chicory, spinach and winter leaves are going great and I pulled the last of the sweetcorn to freeze for another day. 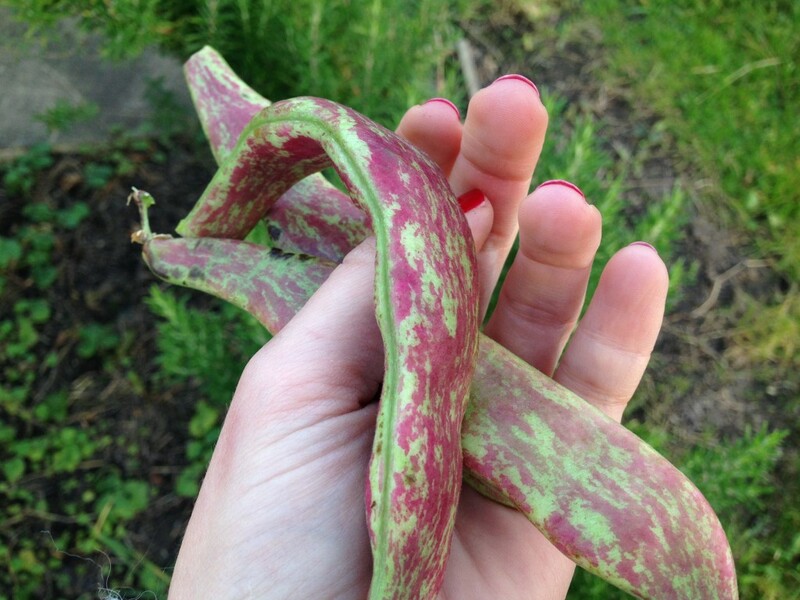 The borlotti are fattening nicely and, believe it or not, I’m STILL pulling the sodding courgettes. 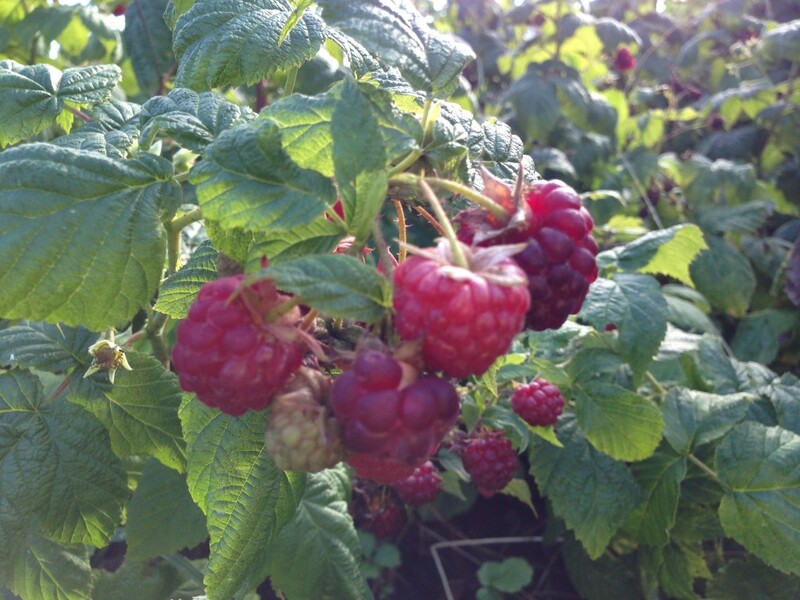 As for the raspberries: I am now so sick of them I’m afraid they are rotting on the canes. It’s not all great news. 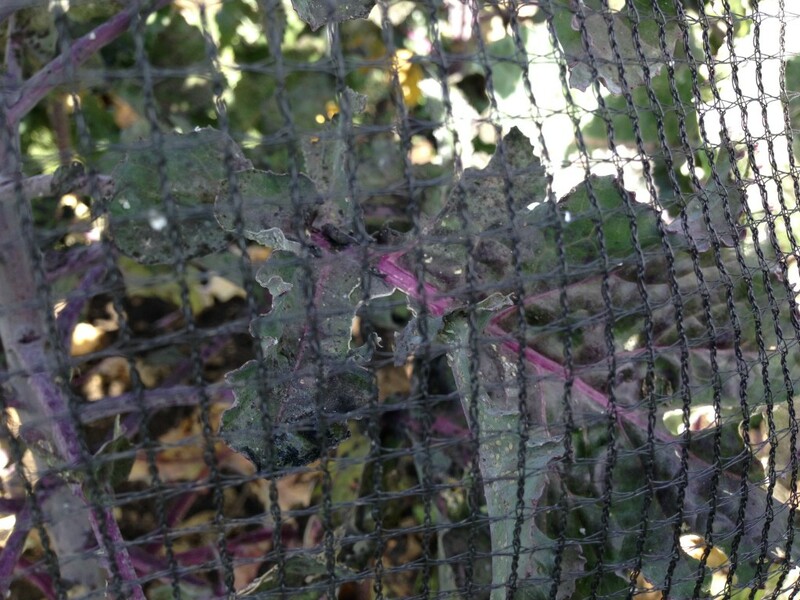 The brassicas, once the plat-du-jour of our foe the slug, has now become a des-res for billions of whitefly. That is not an exaggeration. The leaves are covered in egg sacks and sticky black sooty mould, essentially rendering them inedible. 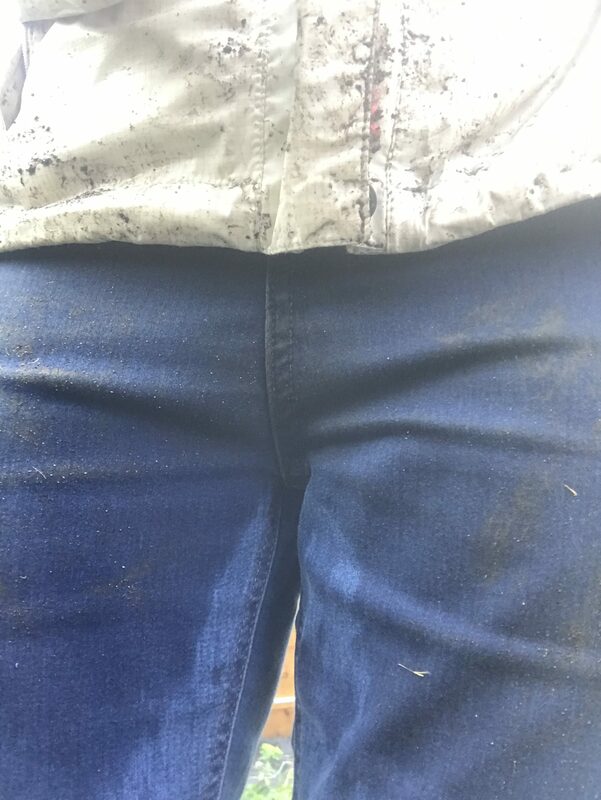 The RHS says to spray them with a weak washing-up liquid solution, which I did, but it has made not the slightest difference. And then there’s the rosemary, which had grown far too great for its station in life and received a well-deserved hack. The compost bin is now even more of a disaster then before. 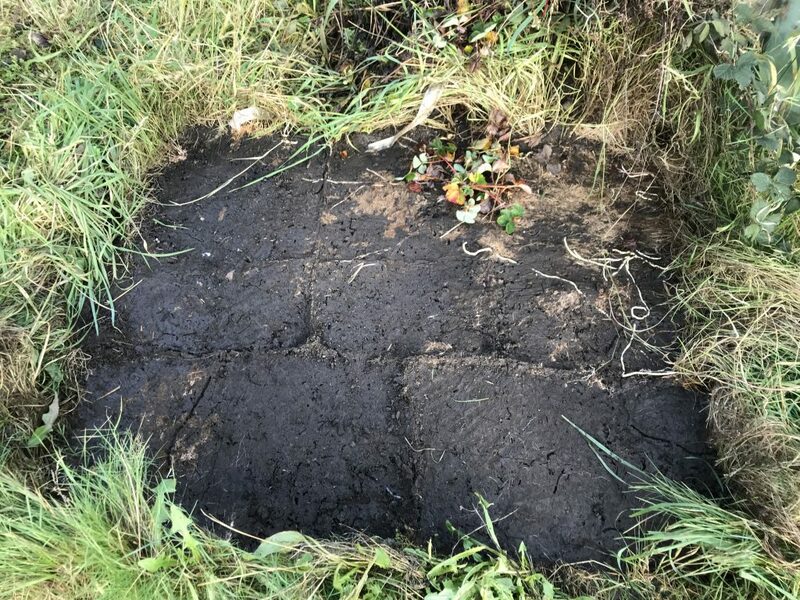 Will someone help sort out the compost heap please?! Apparently this is the time to slow down, but the jobs are piling up in my head: get the grass edges tidied up, pull out the summer planting, sort out the back garden at the house (a MASSIVE JOB), get the bulbs planted, remember to actually cook some stuff, try and think creatively for next year (a contradiction in terms of course). 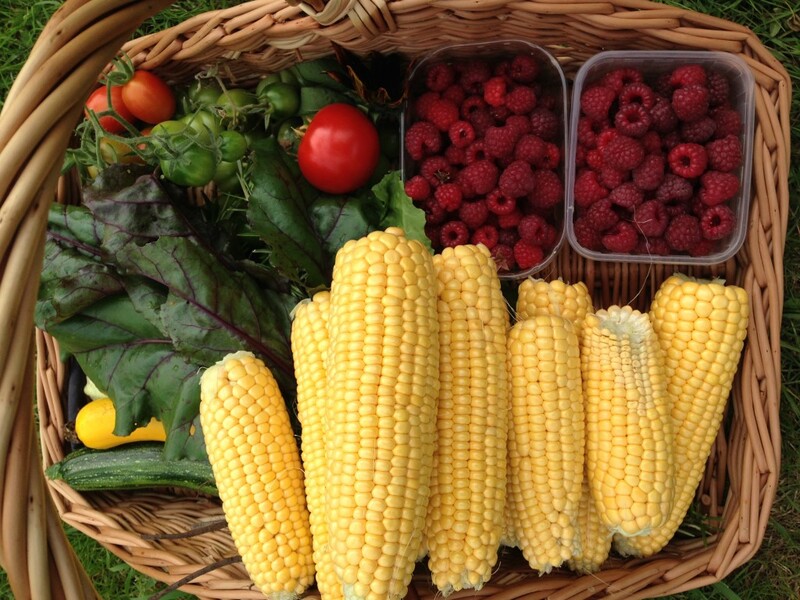 Harvesting: Final stick beans, all the sweetcorn, first borlotti beans, final tomatoes, final aubergines, final courgettes (but I’ve been saying that for a month), gourds, trombocino, raspberries, chicory, chard, spinach, winter salad mix, salad rocket, wild rocket, beets, dahlias, sunflowers, zinnia, chrysanthemums. 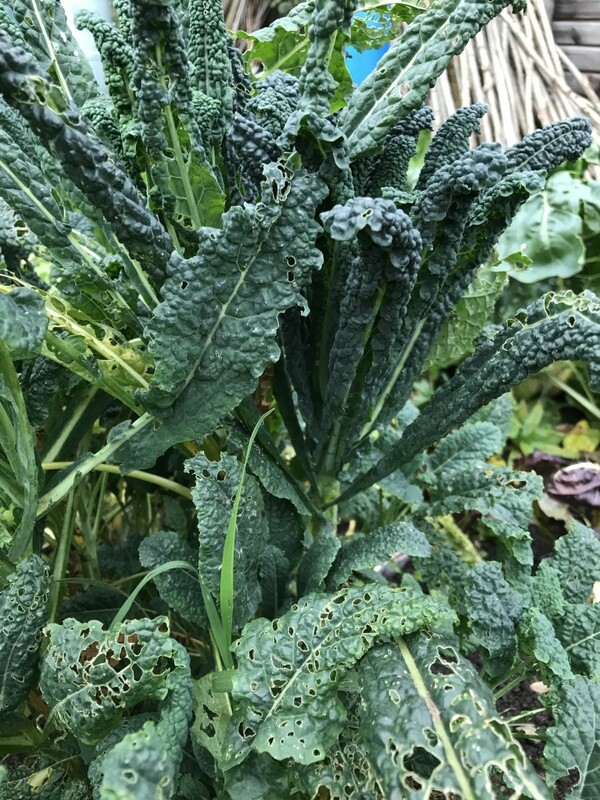 Would be picking cavolo nero if it weren’t covered in whitefly.